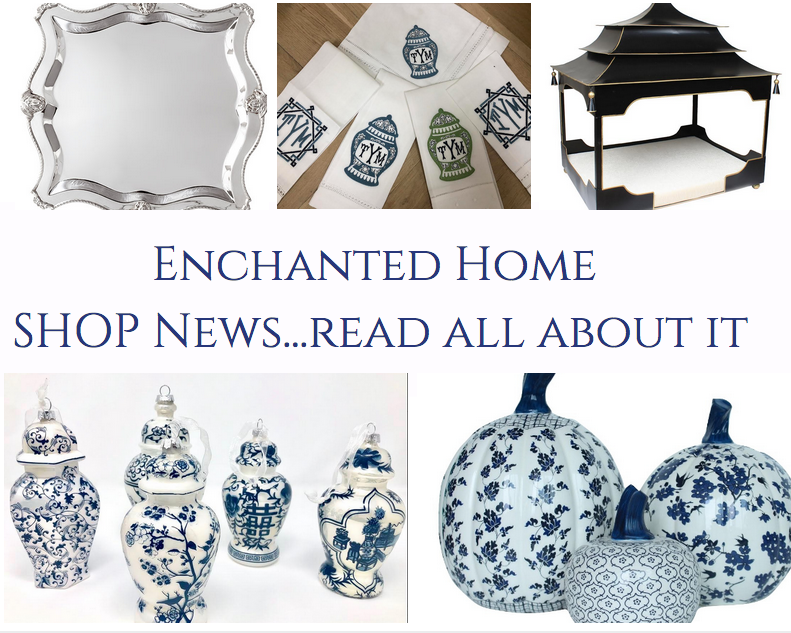 Enchanted Home shop news, a few polls and a giveaway! Good morning friends, busy busy days over here. So many exciting things to share with you. A few times a year I update you on shop happenings with The Enchanted Home and this time around, there is A LOT to tell you about! I feel the holiday energy starting to creep in ever so slowly. Make no mistake it is very exciting, and I love every minute of it but it also requires stellar time management skills and it’s a lot of balls in the air right now. 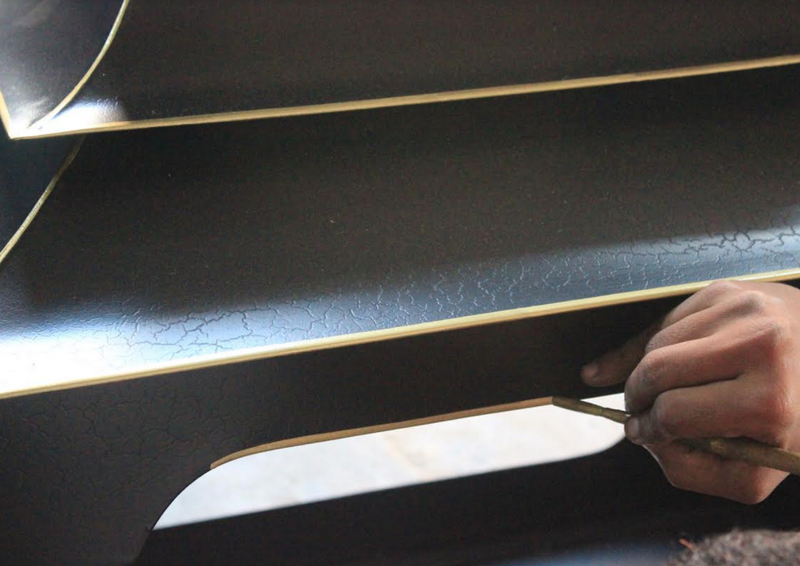 My favorite part is the creating and watching things come to life….the creative process is exhilarating! Most of the things I design are done because I see them in my head but cannot find them despite my searching high and low, which leads me to attempting to create them. A recent example would be the silver mini table lamps, the blue and white porcelain pumpkins and pleated lamp shades. Most of the time, luckily I am successful so that is a thrill in itself:) But make no mistake, there is a lot of time and effort that goes into this behind the scenes but the perseverance generally pays off. There are many exciting things going on right now and I am here today to tell you about most of them, there are a few that I cannot quite share but promise as soon as I can, you will be the first to know:) Consider this a type of “Enchanted Home newsletter”. So I am breaking it down by category in terms of what is new and upcoming so you are fully up to date! I have included several mini polls and to thank you for participating, I am hosting a giveaway. 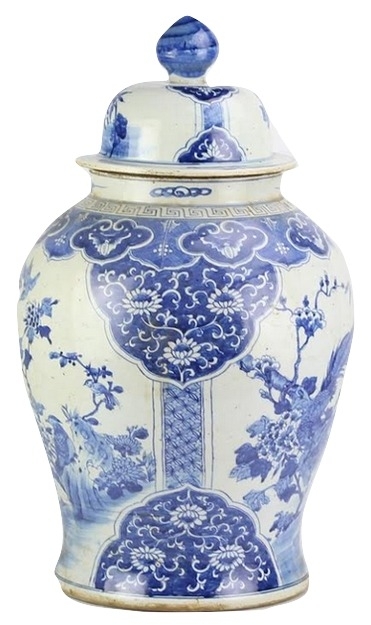 PORCELAINS My blue and white never gets old, and my heart is a flutter every single time a new container comes in! Our October container is due here either Wed or Thurs and we will begin to ship all presale orders immediately as well as hold our usual 1-2 day arrival sale (next week). In this container are a number of all time best sellers as well as some new beautiful new pieces. 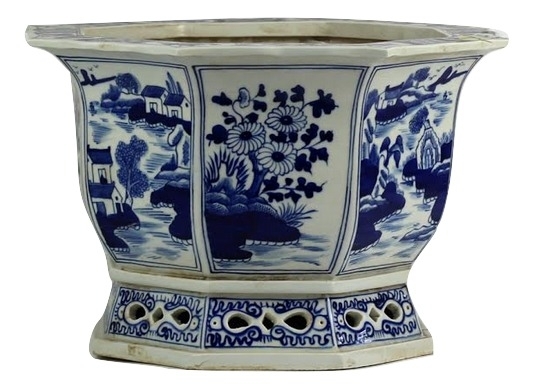 A lot of our customers are regular customers who buy a lot of porcelain and are “serial collectors” like myself. A few times people have asked if we had a frequent buyers club to accumulate points for some kind of discount off a future order,etc…..I have thought about it here and there and wondering what you think? Thoughts on offering some kind of a frequent buyer “club” with porcelains. Would love your thoughts! 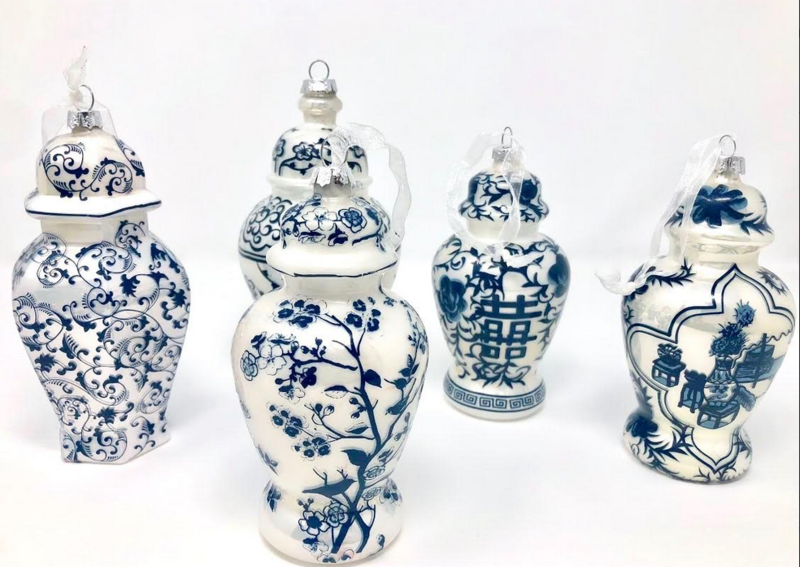 Thoughts on the idea of a frequent buyer club for porcelain buyers? 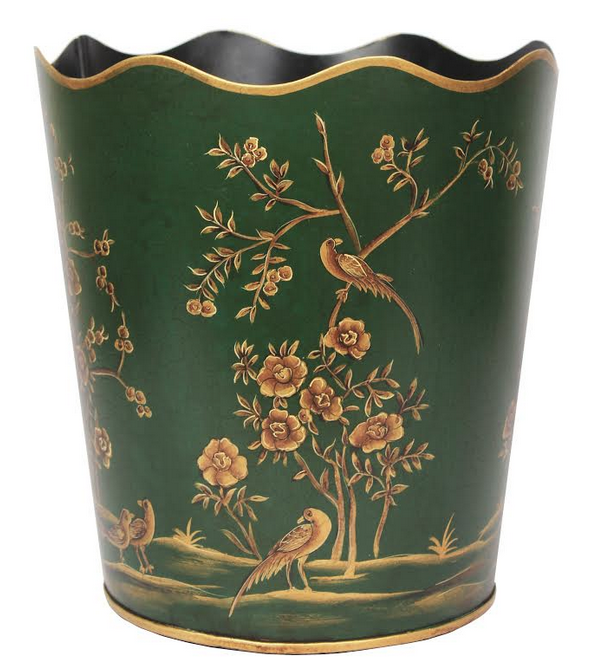 CHINOISERIE TOLE Feast your eyes on all the new incoming beauties here. 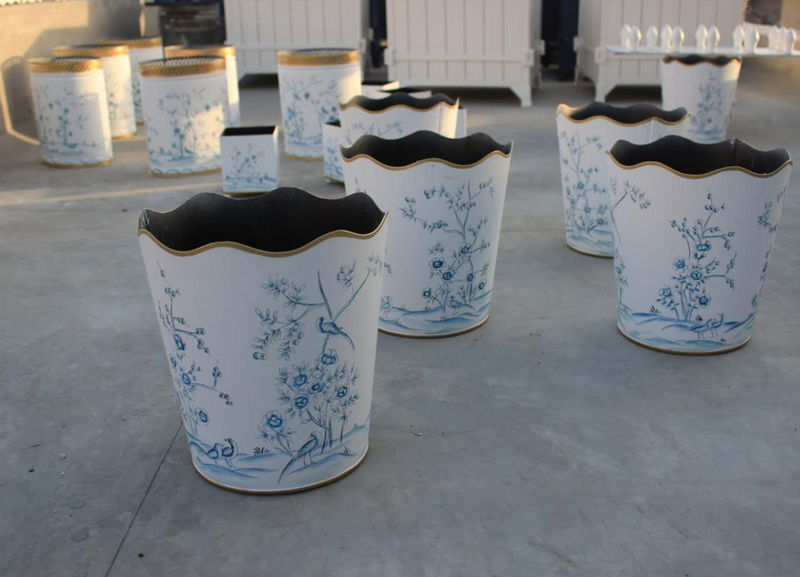 Getting a new shipment in about 4 weeks which will have a select number of Provence planters (some for special order) and the long awaited new arrival dog beds (they are spectacular). 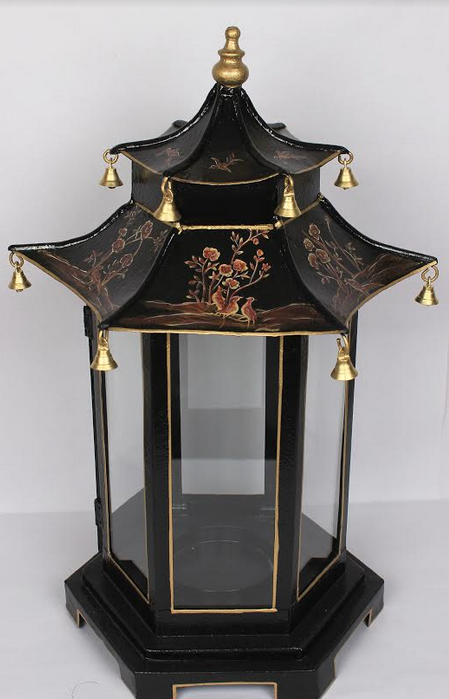 And another new item are these fabulous pagoda lanterns- ooh la la! SILVER Silver and the holidays go together like hot chocolate and marshmallows:) Nothing like the gleam of silver for the holidays. 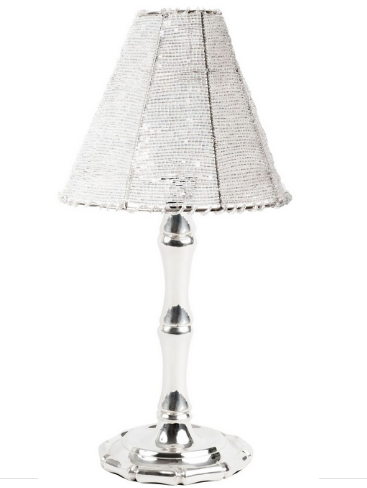 My tabletop silver lamps have been a major hit and we have sold out the last 3 shipments. We are getting in one more shipment of the chargers and mini table lamps before the holidays (within 2-3 weeks). I am happy to announce the addition of a new style which is gorgeous. In that shipment will be all new serving pieces, more of the super popular chargers and a bunch of fabulous new silver planters. All with the holidays and entertaining in mind. 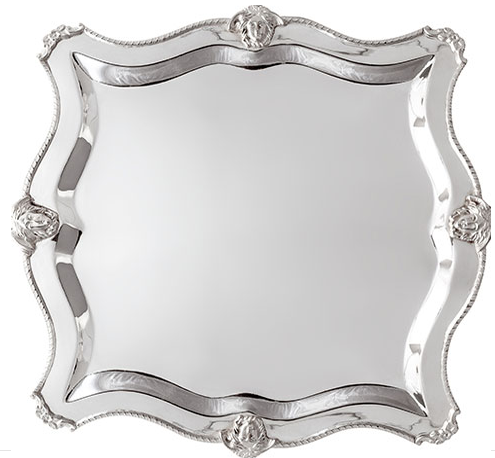 Getting in all of our sold out elegant serving pieces within 2 weeks just in time for holiday entertaining! 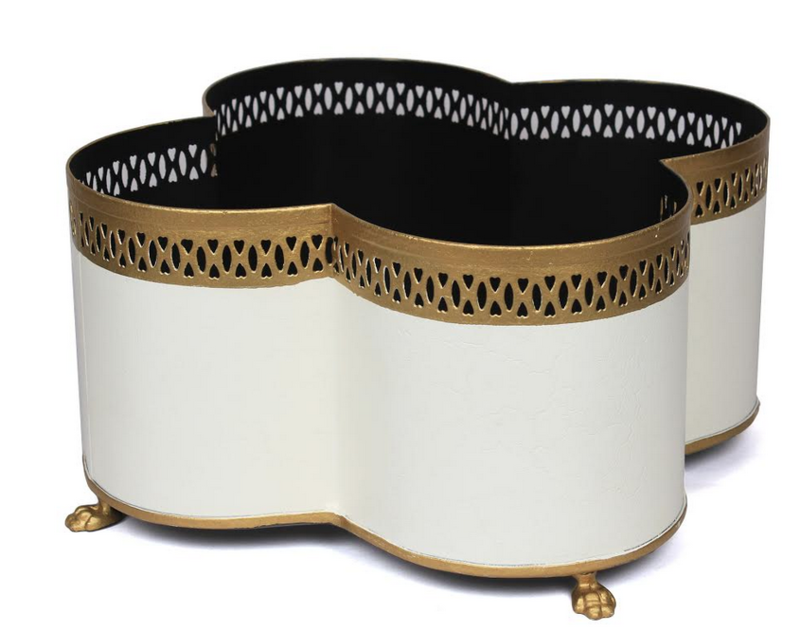 Lost of beautiful new planters are coming in again, perfect for elegant holiday arrangments! Brand new and GORGEOUS new style of the silver mini lamps, coming in just in time for all your holiday tables! Thoughts on this new style mini table lamp? PORCELAIN PUMPKINS! Talk about a labor of love. Dreamed these up a long time ago but they were a long time in the. making, getting the designs, shapes and colors just right. But finally they are done and en route! I kept finding painted fiberglass and plastic pumpkins but I wanted porcelain pumpkins so this is how it all began. 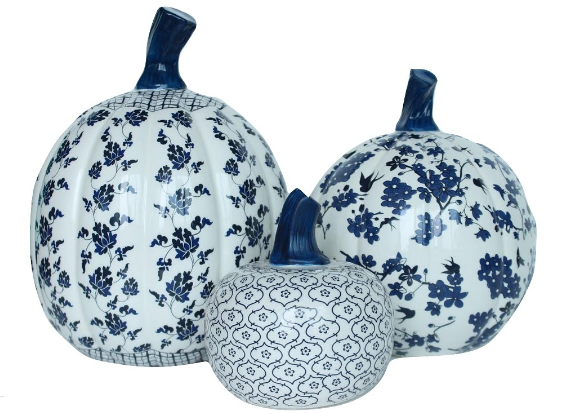 The gorgeous collection of blue and white porcelain pumpkins are exactly what I had dreamed up long ago. Hope to have them here in 1-2 weeks just in time for the height of fall and going into Thanksgiving. These are exquisite, I got my samples and it was love at first sight. Thoughts on adding a few pumpkins each season to be able to continue to collect them? GIFT WRAP Yes, it’s in production and the first shipment should be here around end of mid November then we will get another shipment early Dec. 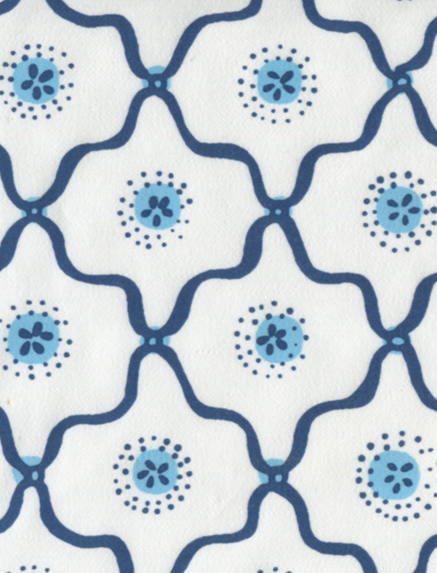 I just love the papers (5 new styles) and we are doing matching tissue and will offer reams of all patterns. 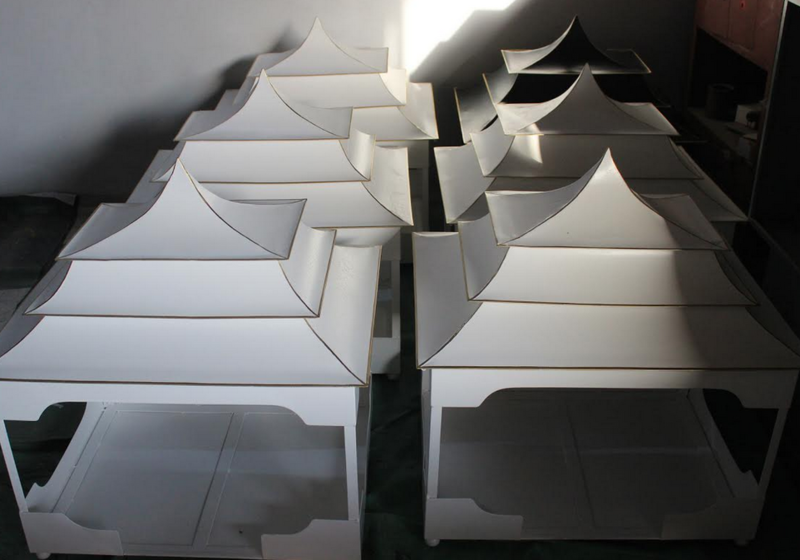 And yes we are bringing back the small ginger jar gift toppers (in 3 styles) and doing pagodas too! This time there will be plenty to go around. 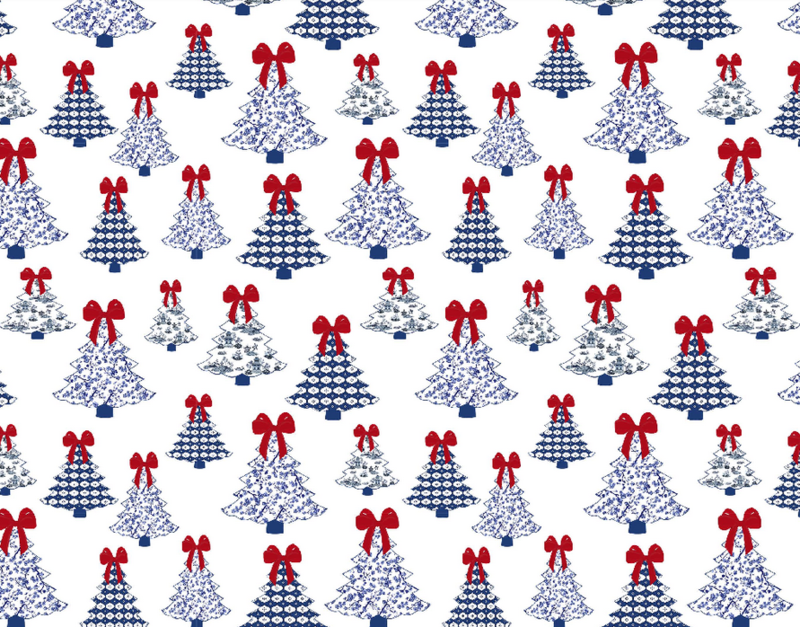 Many have also asked about ribbon, we will also have ribbon- blue and white gingham, red and white gingham and satin ribbons in navy, white, red and mossy green. When do you normally start shopping for holiday giftwrap? I truly love them all but am having a love affair with the newest below that no one has seen until today, imagine this with a rich navy or mossy green ribbon and a little topper added to the top…present perfection! ORNAMENTS! Many asking about these and yes soooo worth the wait! 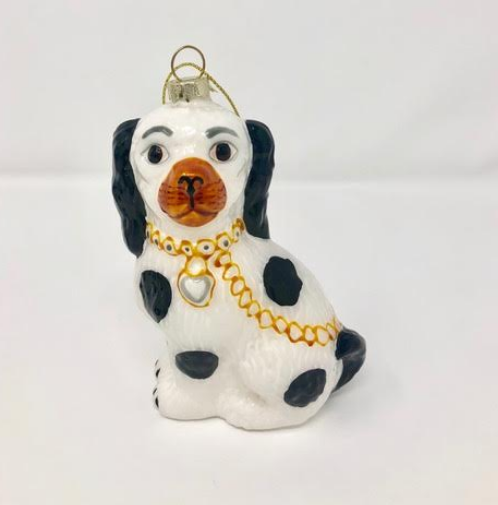 We will be introducing 7 new ginger jar ornaments, bringing back out best selling styles from last year and introducing 3 new Staffordshire dog ornaments in three colors. This is going to be our best collection yet, you can bet on it! These are in production and we will hold a presale as we always do on these sometime next week. The first batch will be here around Nov 18th them another one first week of December, in plenty of time for those of you who are early bird tree decorators! The presale pricing will offer lower pricing than what they will be when they arrive and are sold by the box. In addition, by popular demand we are bringing back the little 3″ gift toppers in three different styles! A lot of people have asked us if we offer some kind of package or consultation for how many ornaments they would need to decorate an entire tree. Based upon experience we have begun to be able go guesstimate approx how many ornaments certain size trees can hold to appear full and decorated properly. Some have suggested we sell the ornaments in “packages”. Say for an example, we think 200 ornaments for a 6 foot tree- so we sell a box of 200 assorted ornaments at a discounted price. Thoughts? PLEATED LAMPSHADES! 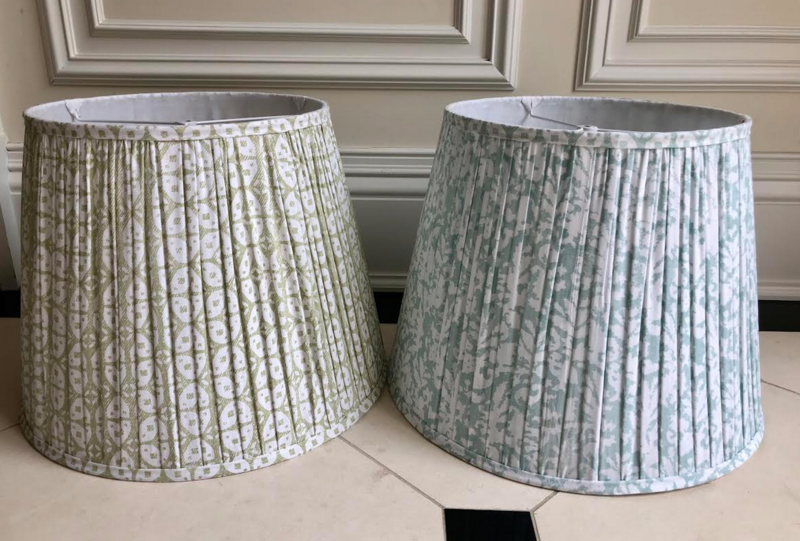 So thrilled about this new addition to our line based upon my love for pleated custom lampshades so popular in the UK and Europe. I have loved these for a long long time, and am excited to announce a beautiful carefully curated collection is being manufactured as we speak! I hope to have my first batch here within 3 weeks. So excited about this. There is indeed a really market for these and I decided to just jump in and do it. So stay tuned!! 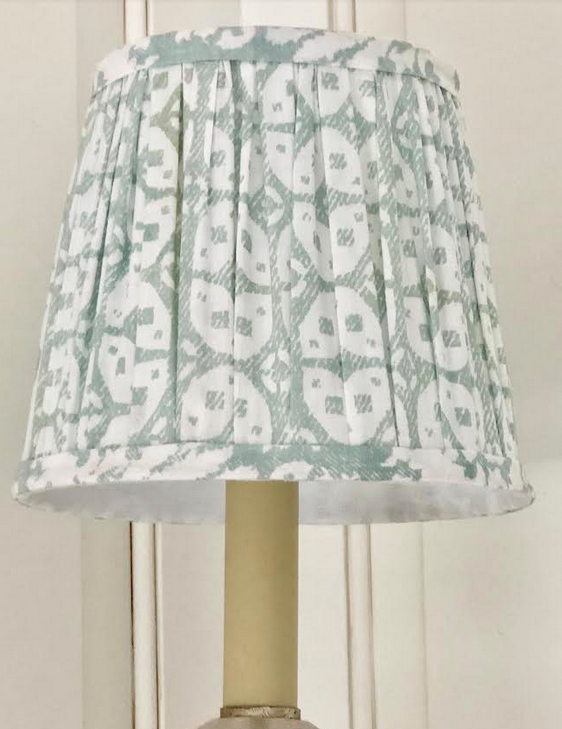 Thoughts on pleated custom lampshades? LINENS. 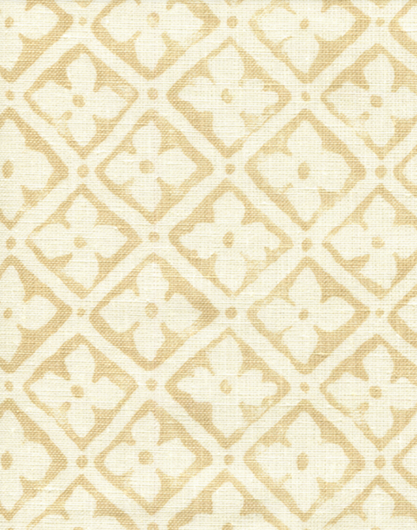 Just got in a beautiful line of 100% gorgeous linens in napkin, place mats and pretty guest towels. The price point will be very competitive and I would love to know your thoughts on these new patterns? Thoughts on these ginger jar and bamboo monogrammed linens? 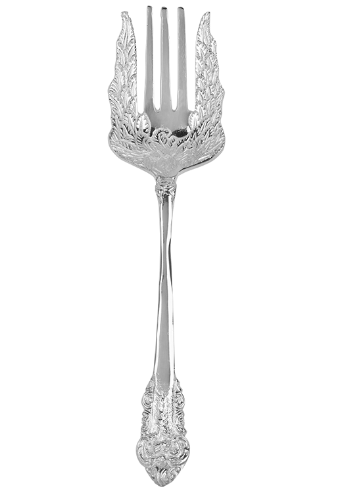 Thoughts on this basketweave flatware? There are a number of other exciting developments in the works, pillows. a line of wicker hurricanes and flatware which I will share more as things move along. Suffice to say by subscribing, you are an automatic “insider” and the first to find out about things as they happen, so stay posted! Is there any one category you would like to see more of? As a thank you for participating in these mini polls, I am offering one winner a choice of 6 giftwrap rolls (of his/her choosing) either from our holiday or everyday giftwrap! How to win? Just leave a comment on this post telling us the item(s) you are most excited about and your name will be thrown in the hat. Winner to be announced on Thursday. PS A reminder- 10% of all shop sales for The Enchanted Home will be go forwards Breast Cancer Awareness Foundation in honor of it being breast cancer awareness month. A disease sadly that has probably touched our lives all in some way shape or form. It is an honor to support this noble cause. This commitment is in partnership with Charmajesty Linens. Click here to see the shop. Just love your new ideas for upcoming products. Everything you do is well planned and so very beautiful. I would love to see more table linens especially tablecloths that are 70 inches wide. I know with your fabulous taste, my home will be more beautiful with every purchase. i love all your new developments. You are so creative and I get so many ideas from you. THANK YOU! I only wish I had a larger house to accommodate all the things I love! Good Morning! I am just so excited for the giftwrap and the ornaments! I have some from last year and can not wait to get more for my collection. I am just smitten with the beautiful designs on the ornaments. I will be buying some for gifts too! 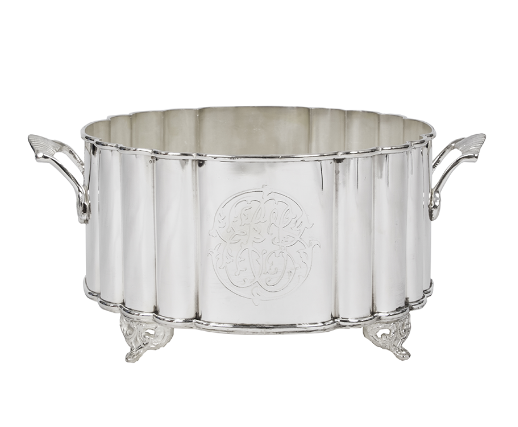 Love the silver chargers and silver planters. Your gift wrap paper is the prettiest I have ever seen! Love the linens, but with Christmas around the corner, it’s the Staffordshire dog wrap I love the most! 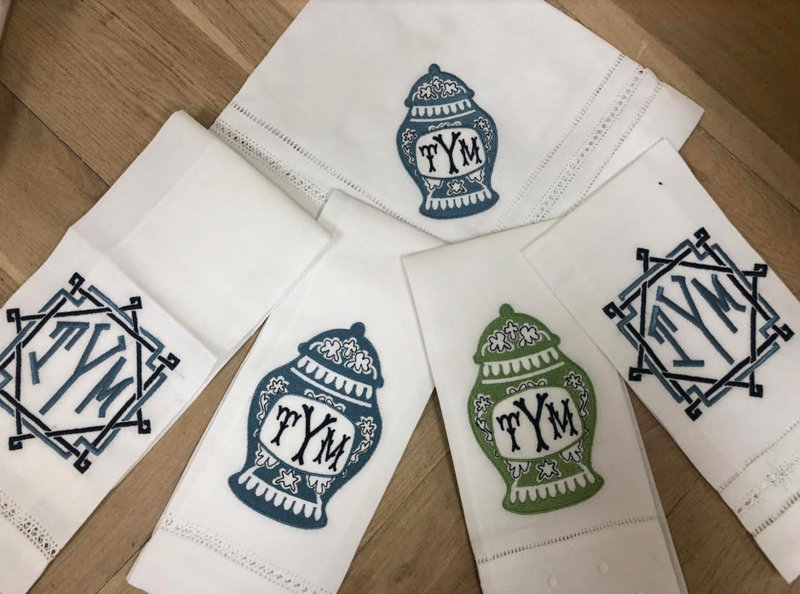 Excited about monogrammed items & holiday gift wrap! Everything is gorgeous! It’s more like what I don’t love- and I do love it all! 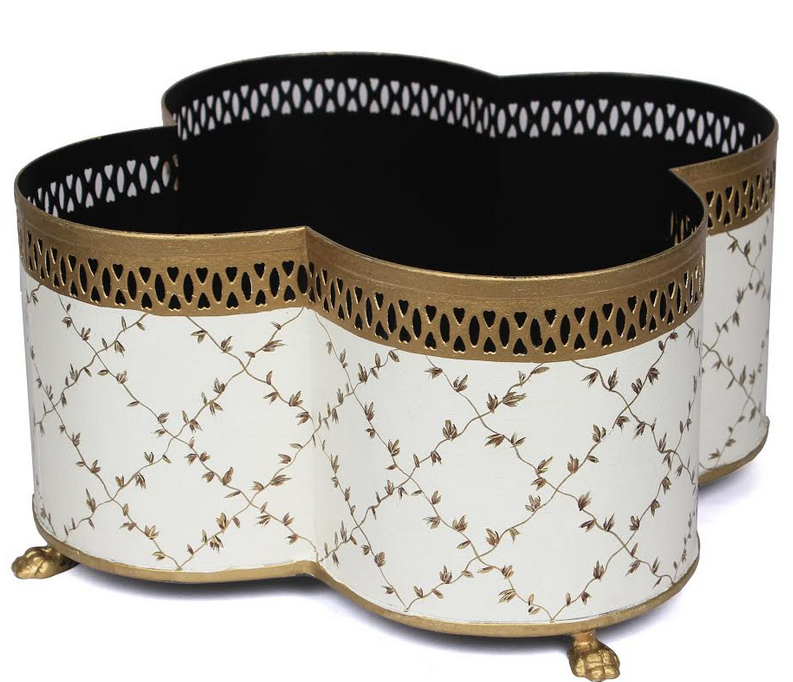 The ornaments, giftwrap, pleated shades, pumpkins (already ordered) that pagoda bed and the new quartrefoil planters are all must haves. Oh and the new style silver lamp NEED those for my Christmas table. Tina, your creativity is a gift to the world, so thank you and please keep on creating, we all love what you are turning out! I am most excited about the new mini ginger jar ornaments. They are so adorable! I would be thrilled to own any one of your items! Linens, wicker hurricanes, lampshades and pillows get me excited. Have enjoyed my all occasion gift wrap and looking forward to the holiday wrap. Many thanks. 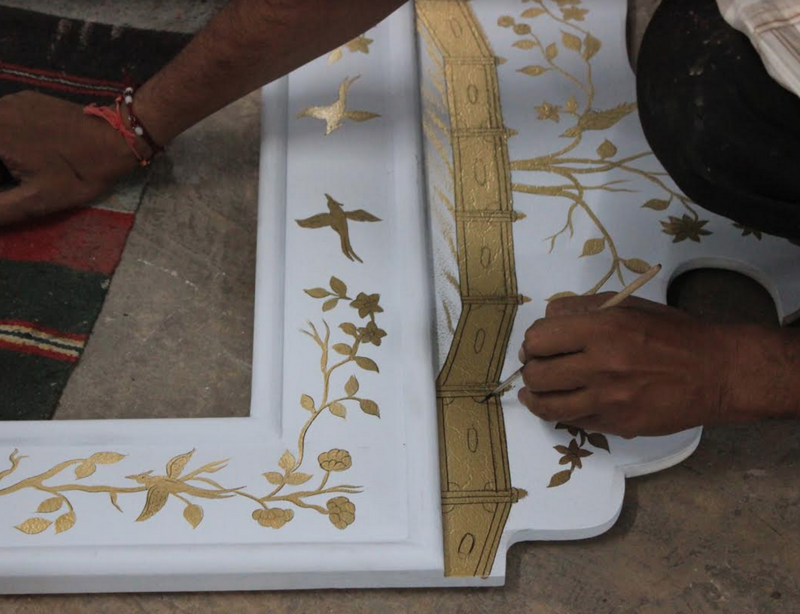 Very excited to see the finished chinoiserie hand-painted metal shades. Looks great already! They are so many beautiful things contained in this post, that it’s a sensory overload (almost). But, your gift wraps are beautiful and very elegant, guaranteed to elevate even the simplest of gifts. I cannot wait to order my favorites. 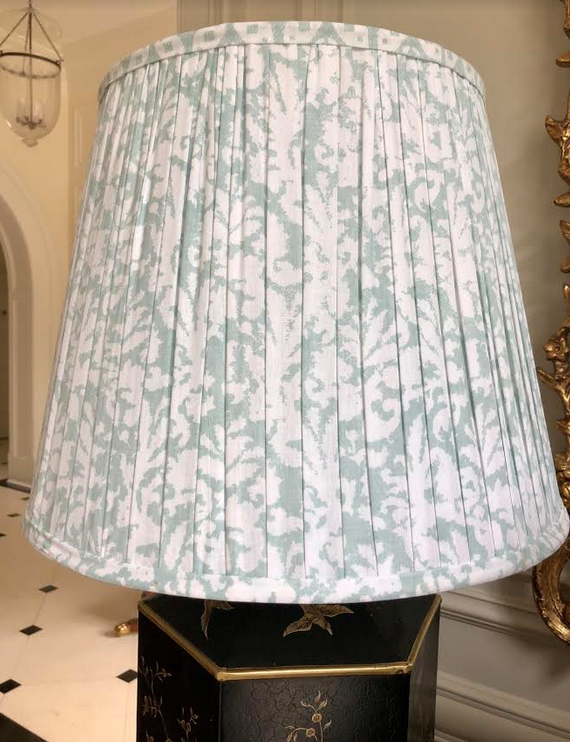 Very excited about the pleated fabric lampshades! Would love a contrast trim too! How about a wicker lampshade as well, in the future. You are a busy lady! Love all your ideas! But when do you sleep? I love all your beautiful wrapping papers and ribbons. Over the last few years I have fallen into the “ stuff it into a cute gift bag with coordinating tissue” easy way out. I really hope to get back into wrapping gifts with more care and thoughtfulness. There’s nothing so cheerful as receiving a beautifully wrapped gift even if what’s inside isn’t that grand. I am excited about all your holiday items especially the gift paper. So winning some would be fabulous! 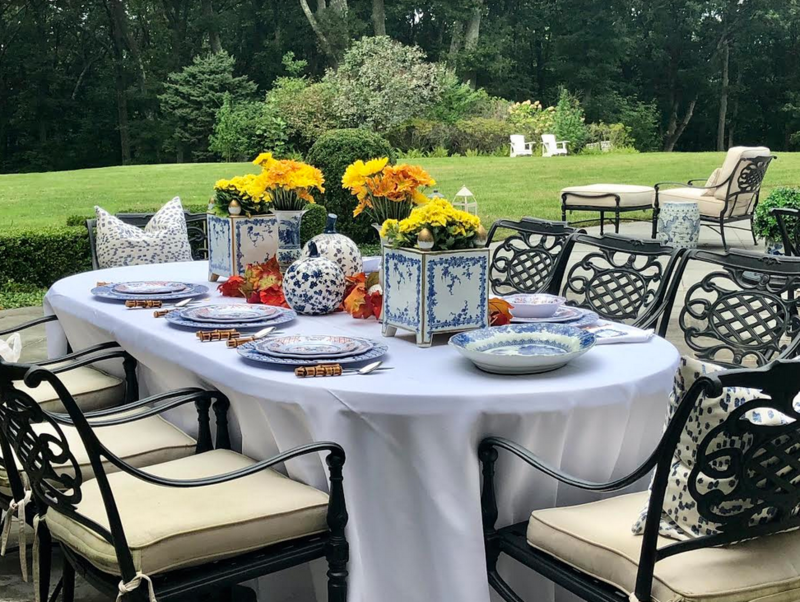 Love it all but really wanting the Provence Planters & Monogrammed Napkins! I am excited about all your Christmas wrapping paper esp. the new ones; so winning some would be fabulous! 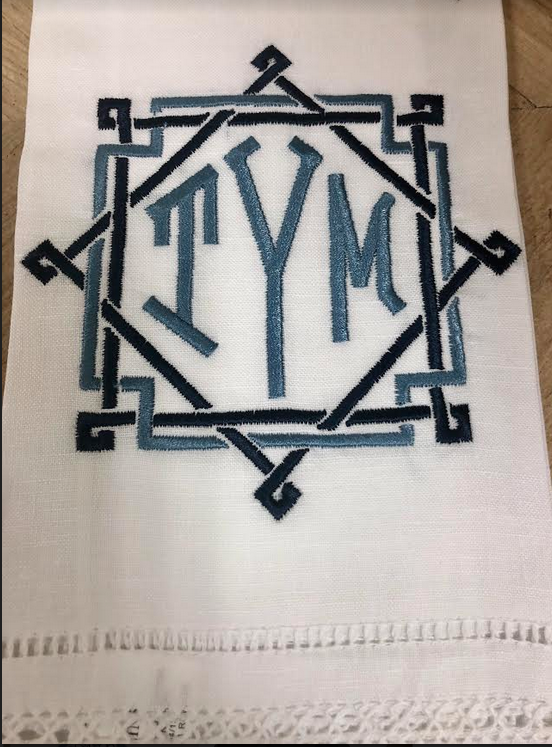 The monogrammed guest towels are beautiful!! 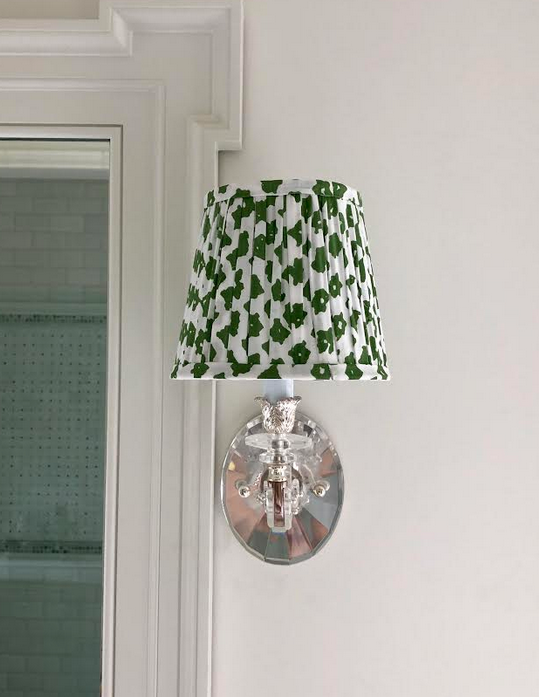 Love the new lampshades, especially for sconces! I love the wrapping paper with ribbons! I also adore the mini ginger jar ornaments. hope you do offer the ornaments as sets. I bought some last year and love them, unfortunately 2 were broken when we moved to our new house. I will replace them this year! I am most excited about the new silver chargers, the new table lamp and the new ginger jar ornaments. Those new Georgian style chargers took my breath away! The ornaments and wrapping paper are my favorites! I am most excited for the lampshades if they are in my color palette. They are lovely. What great ideas are in the works! I am most excited about the ribbons! I like different textures on a tablescape. 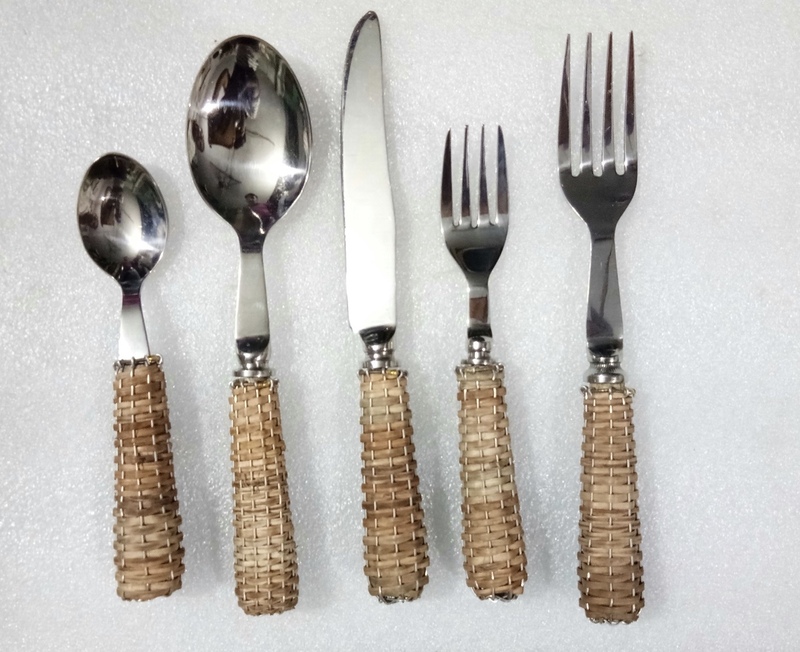 The basketweave flatware would be a nice touch all summer long. love the hand painted lamp shade. so pretty and elegant. Adore the new wrapping paper. Wow….. so much eye candy. What a perfect way to start my day. I LOVE the new style silver table lamp. I’ve been contemplating purchasing several in the past for my holiday table and think I’m ready to pull the trigger when the shipment arrives. Thank you for providing such elegant items; they truly can’t be found anywhere else. 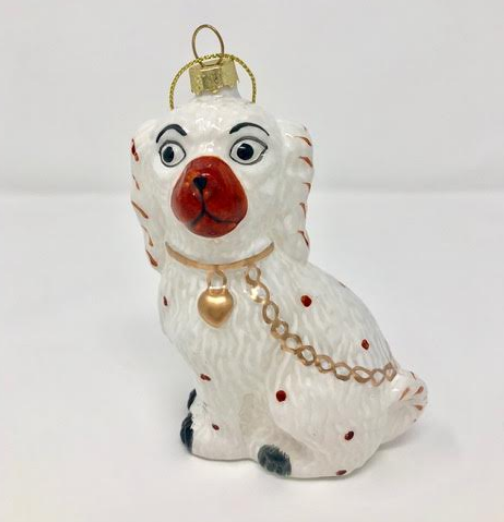 I look forward to the staffordshire dog ornaments! There are lots of pretties to entice one for the holidays. You are certainly busy like Santa’s workshop!!!!! 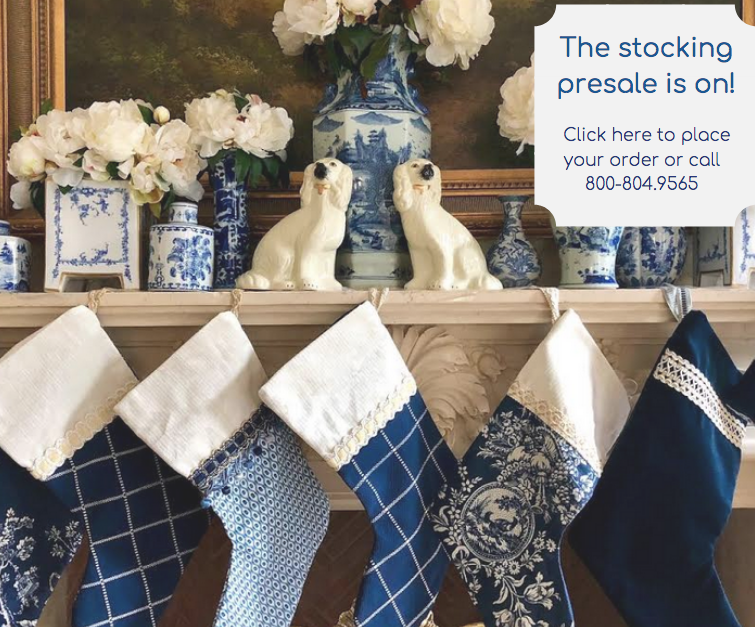 Enchanted Home, you are bringing the “enchanted” to my home for the holidays with magical blue and white pumpkins, delightful Staffordshire dog ornaments and delightful monogrammed linens. All of these beautiful touches will make my home more magical for the holidays! Love all of the ornaments and hope to see hand painted metal lamp shades soon! So excited to preview coming items! Hand painted metal shade is beautiful. I cannot wait to receive my pumpkins!!! Super excited for those to come in. I also like the wrapping paper…and the ribbons!!!! I love ribbon and I find it hard to find nice ribbon for gifting. So I will be looking forward to that coming in as well. I cannot wait for the ginger jar toppers. I have changed my whole holiday theme in anticipation! Wow, that a whole lot to be excited about. 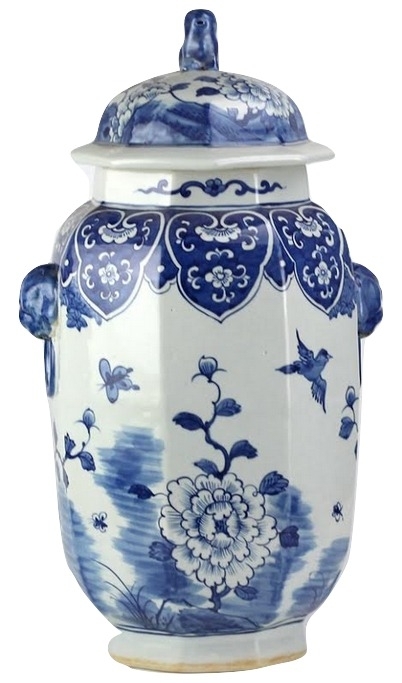 I’m always excited to see the blue and white and can’t wait for my new ginger jars to arrive. I hope you will get the “Ralph Lauren” vases again sometime, so I can get another one. 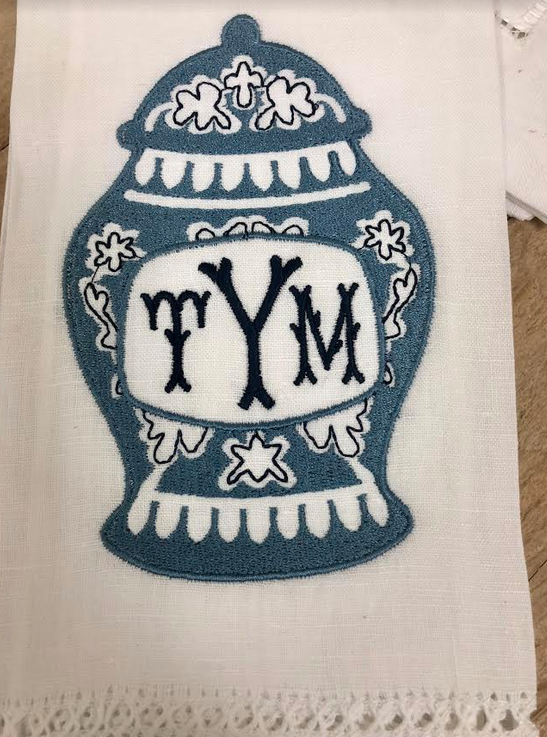 I’m always excited to see what new blue and white porcelain’s you’ve added and especially excited for anything monogrammed that you add to your lovely shop! I would love to do a whole tree with your blue and we hire ornaments!!!! Loved seeing the pleated lamp shades. Have been wanting to change out a couple of shades in my home and these would be perfect. 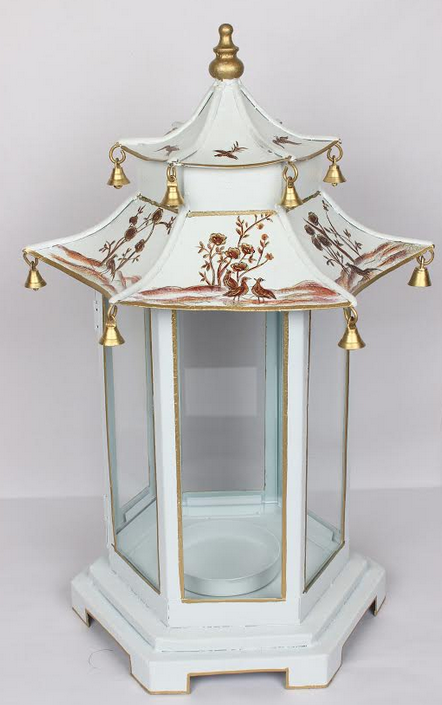 I am very excited about the pagoda lanterns and Staffordshire dog ornaments! What an exciting post! Lots of beautiful items in the works. Most excited about the monogrammed linens. Thanks for sharing your time and talent! I love all the new ideas you are coming up with for our homes. 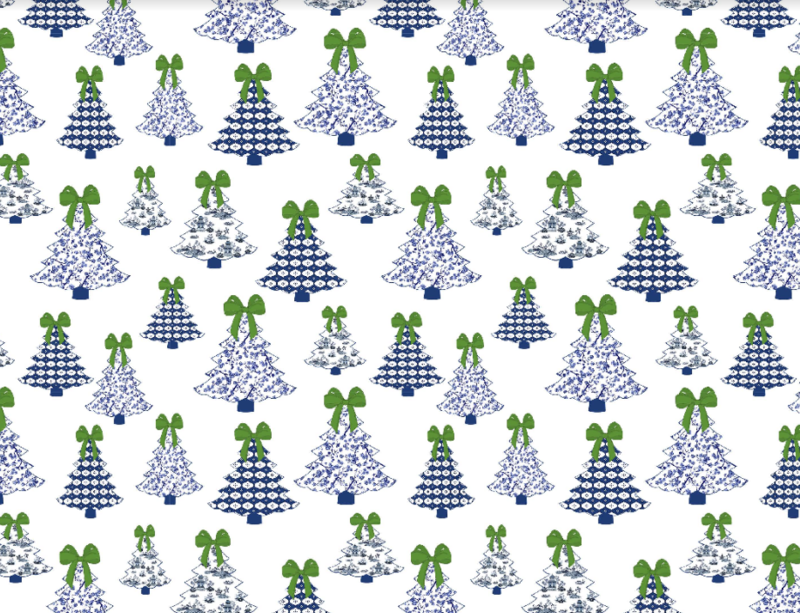 Looking forward to the holidays and to begin decorating and adding some more blue and white in either ornaments, gift wrap, table linens… the list just goes on. Very excited about all of the possibilities for Christmas shopping (and for me)! Buffalo check table linens definitely caught my eye! i love a beautifully set table with lots of layers! Well I have the table lamps and they are wonderful. 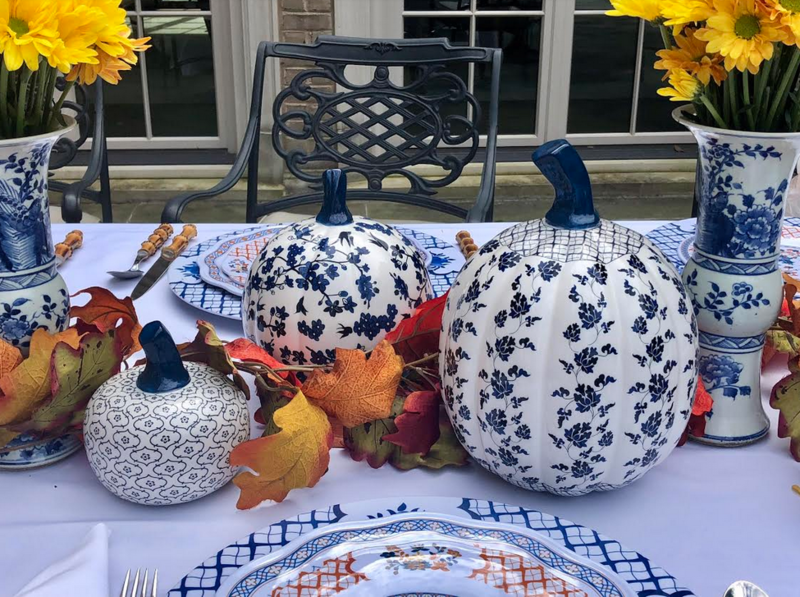 Hope you will have a Tablescape contest for November of the Thanksgiving tables. It would be delightful to see everyones table. The buffalo check table linens definitely caught my eye! I love a beautifully set table with lots of layers. I’m always excited about anything blue and white. I’m especially looking forward to seeing the ornaments and wrapping paper that’s coming out! I wish I had your energy! So many great ideas and the energy to make them work! You are inspirational! 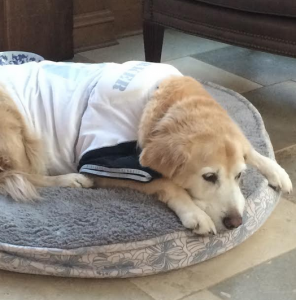 Can not wait to order a dog bed for my furry child! Hoping the bed will fit my 60 pound girl. I have and so enjoy using your Christmas gift wrap and would love to have more!! I moved and had been away for 4 months, what have I missed! I can not wait to include so many of your new pieces! The staffy dog ornaments…over-the-moon! Loads of lovely new items! Can’t wait for the pleated lamp/sconce shades! I’m excited about the ginger jar ornaments which are sold out. 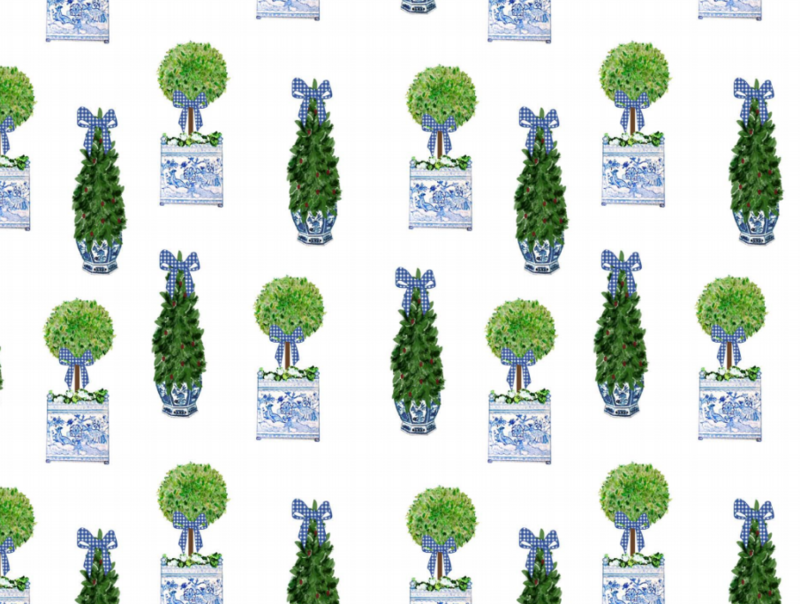 Also looking forward to the topiary wrapping paper. 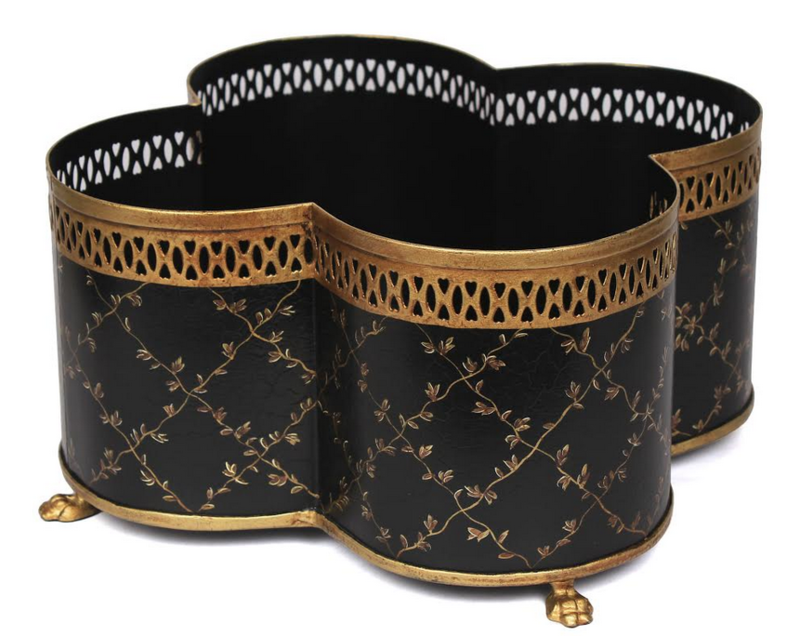 The pierced rim quatrefoil planters are just beautiful and so many colors from which to choose. Also, I am loving the new silver mini lamps. 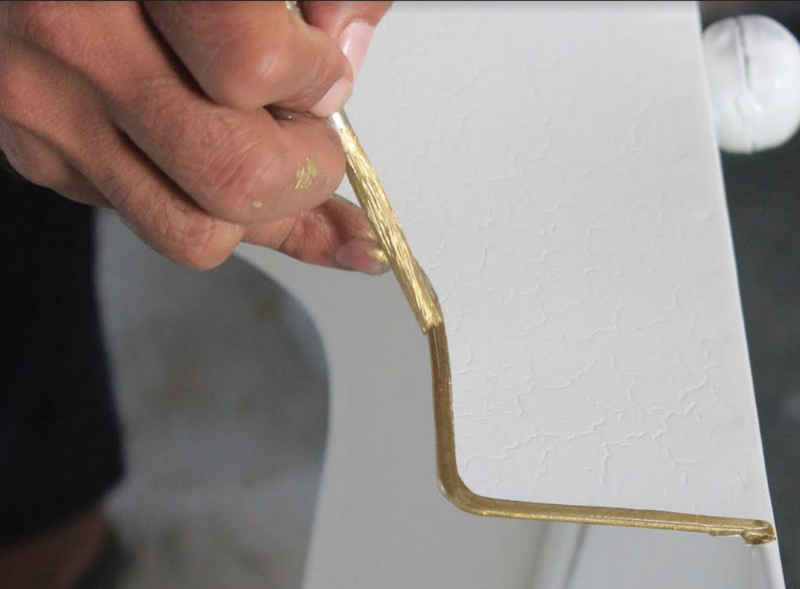 The base appears very substantial which adds to the beauty. It is always such a treat and inspiration to see all of your new goodies.. I loved this post! Thanks for including us in the choices! Love my mini lamps. Hope I win the gorgeous wrapping paper!!!! I love everything you do! I especially love the new wrapping papers and the little silver lamps! Cannot wait to shop for the Holiday! I thought of so many gifts I want to give while I looked through this Post. Wow, so many exciting items! I am most excited about the dog beds! I have 3 Cavalier King Charles Spaniels who would look pretty cute in it! Cannot wait for the ornaments. Gave several as gift toppers last year. So excited about the Christmas ornaments! Let the decorating begin! 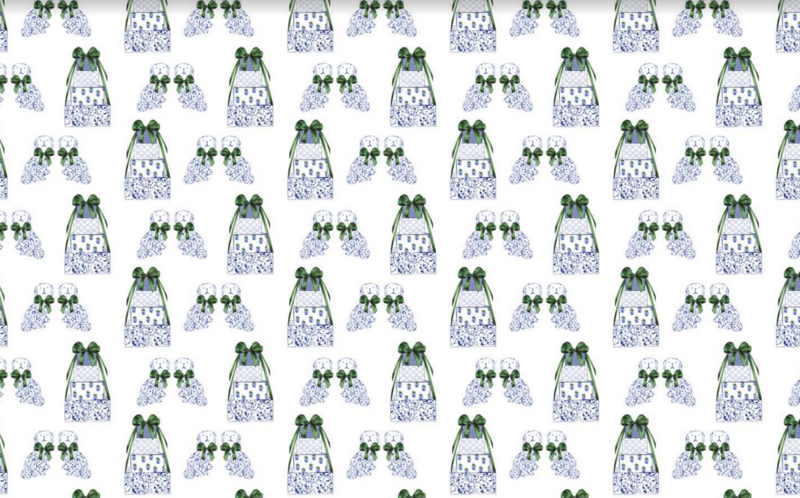 I need to replenish my supply of your gift wrap and am in love with your new designs! 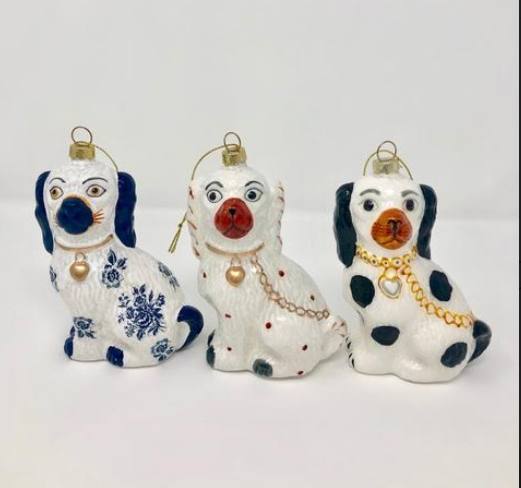 The new ornaments (especially the Staffordshire dogs) are so sweet and will definitely be adorning my tree this year! Just LOVE, LOVE, LOVE all that you create!!! 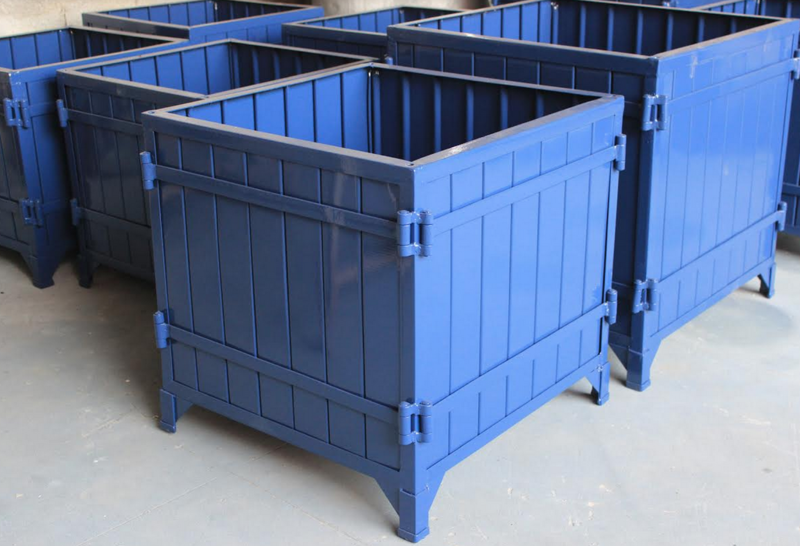 I can’t wait for your next few containers to arrive! I have already placed my presale orders and excited to receive my new pieces from your beautiful collections….I even have a new Ginger Jar arriving this week from the Enchanted Home!!! The wrapping paper is so unique! Linens also extra nice! Wow! What a post! 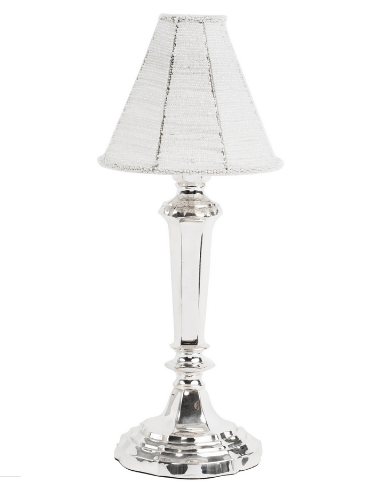 Love the new silver mini lamp, and your consideration for a frequent buyers club! Those dog beds are going to be a core product of your for years!! I am most excited about the new planters and lamp shades! Can’t wait! Thank you for this giveaway. 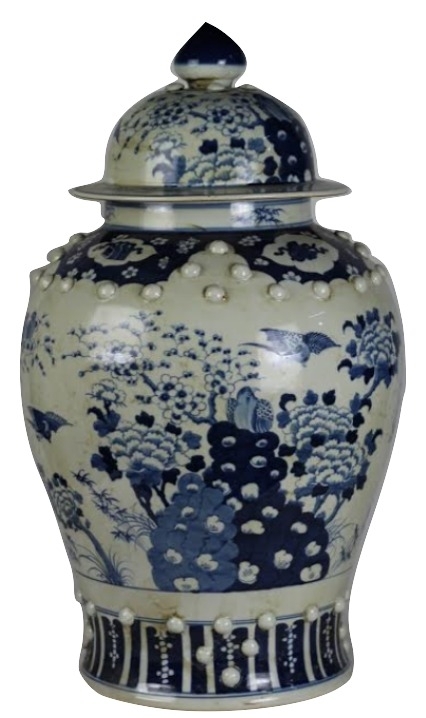 I am so excited for the new ginger jar and Staffordshire dog ornaments! I’ll need a least a box of each new style! Also, the new dog beds are quite possibly the cutest things EVER! My pampered pooch is definitely going to need one! 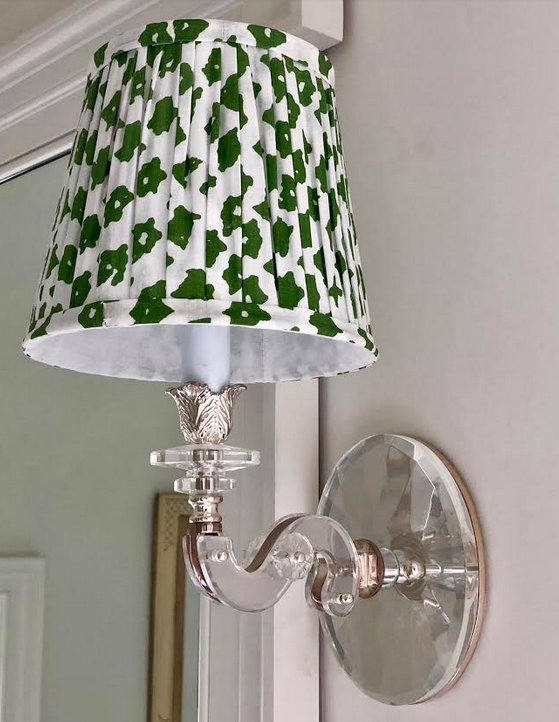 Love all the new things….A suggestion…..A silk shade would be nice for more formal spaces (dining room, powder rooms, entry halls…etc, and tartans for more masculine rooms….such as a library, study, office. Love everything you are doing…..
Adore the little ornaments to tie on the packages along with the matching paper. Already thinking of decorating because here in Colorado we are expecting snow today. I need inspiration because I’m house bound . Thank you for being so kind. I especially love the silver charges! 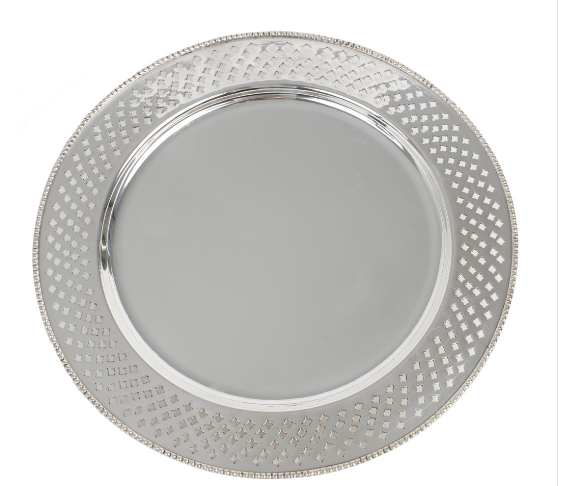 So elegant and would perfect for my holiday dinners! Your gift wrap is exquisite..would actually enjoy wrapping gifts with it! I so love the new style of silver mini lamps! I’ve missed out on the last shipment, hoping I can order in time on this new style! 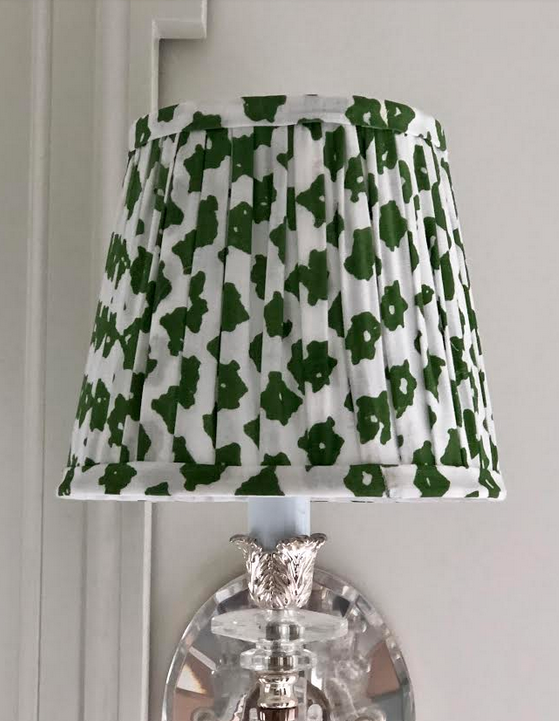 Also love the new pleated lampshades coming out, it would just be a matter of coordinating the patterns and colors with my current color scheme. Can’t wait to see final products! What a fun interesting post!! 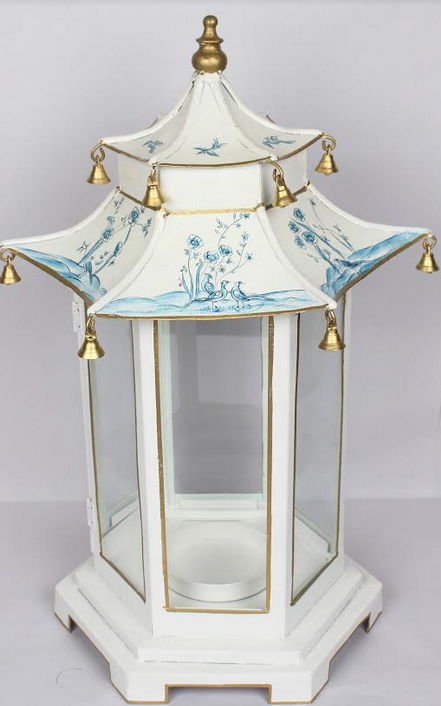 Love the new pagoda candle lanterns! Tina you must have been tuned into my wish for them! Also can’t wait for the Christmas wrapping paper and little ginger jar gift toppers. Holiday ornaments to start my collection! Love the custom linens and gift wrap! Just love the dog ornaments !!! So many exciting items! I love all your ideas. Looking forward to the Christmas ornaments and gift papers, ribbon would be a nice touch . It’s never to early to start planning for Christmas! Love all the new products. Was wondering, are the basketweave flatware dishwasher proof? Can’t wait for the pre-sale! So excited about the lampshades! Have been looking for a reasonable source with pretty options for months. I’m so excited about the porcelains coming in and THE LAMP SHADES!!!!!! Oh wow! There’s so much potential there. I know you’ll design beautiful things I won’t be able to resist. Can’t wait for the new ornaments and gift wrap. It is hard to believe it is that time of year already. I would just love to have the Pagoda Dog Bed. I have been looking for one and the company that I was going to order from no longer has them. My little dog “Belle” would look like a little princess in the bed. Also, I was hoping that you would do a gold mini table lamp. I love that you’re always thinking ahead and curating a collection tailored to your readers! 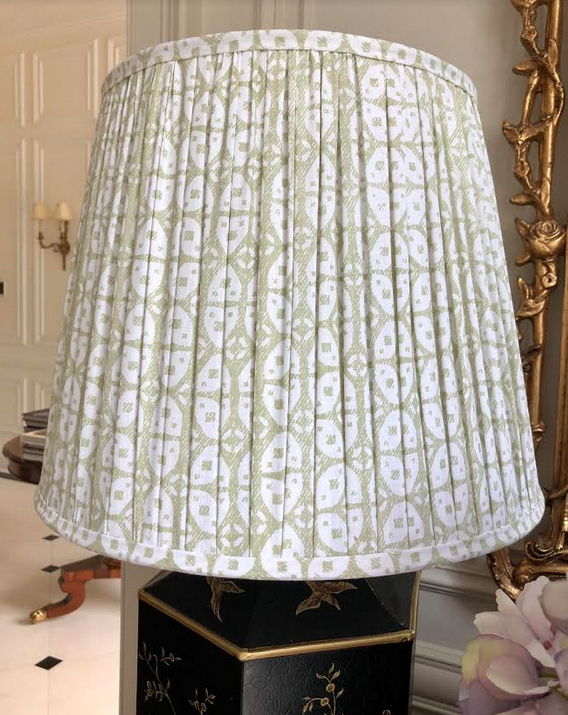 I love monogrammed linens so much, but am excited by the lampshades also because they are so unique. I think they could bring a very custom designer look to a few of my rooms, for a very reasonable price. I love the new gift wrap and ornaments! But I also love the new design of the mini lamps! I want some of all of it! Table linens are gorgeous too! I want it ALL!!! I am definitely most excited about the gift wrap with coordinating tissue and toppers! Oh my goodness. Everything you have is beautiful. I really love the basket weave flat ware. 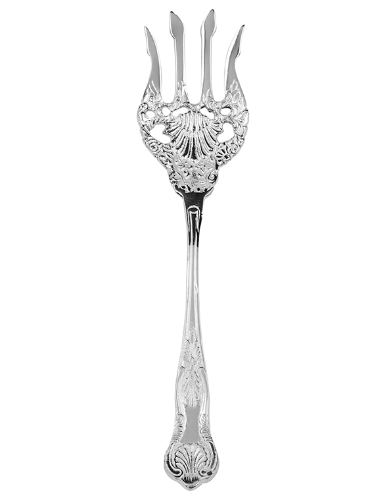 The flatware would be perfect for so many table settings. 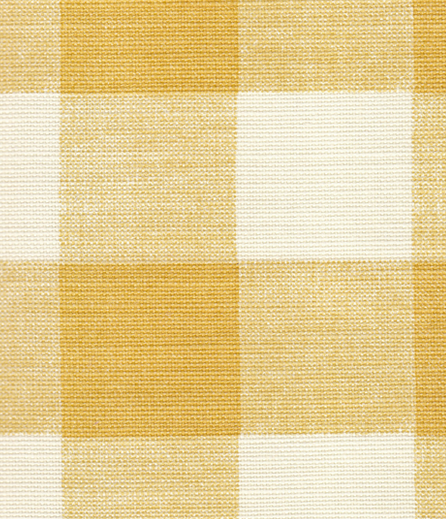 Also find the yellow buffalo check linens so fresh and cheery. 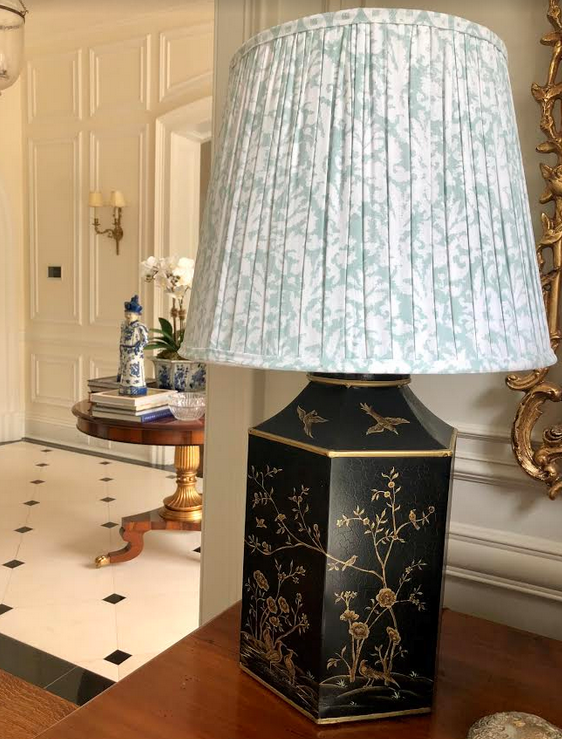 Adore the lampshades, especially the chinoiserie metal shade. Your creative ideas meet the decorating needs of your followers. Thank you. 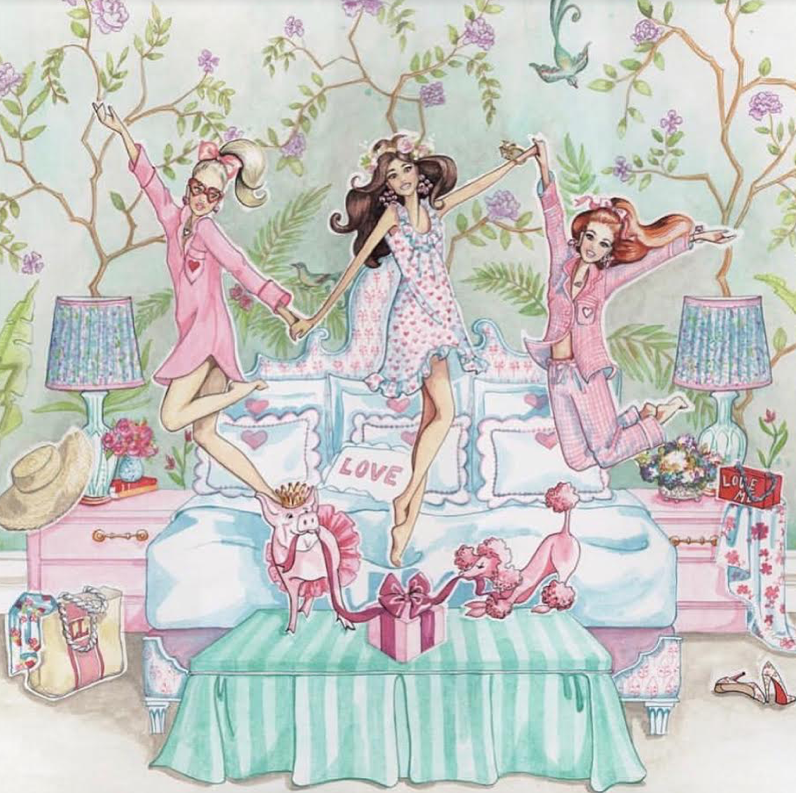 Love, love, love all of your new designs and new products, especially the new wrapping paper, table lamp, and monogrammed linens. Wow! Everything looks amazing but I am enchanted with the new table linens. You are really filling a much needed niche! All the new items are fabulous and so excited to see them all. I love the silver mini lamps but would love to see the shade available in a cream or white fabric. Everything is really pretty. Love, love the gift wrap, especially with ribbon! I have this ribbon and can’t wait to see more ribbon and all occasion wrap. Really love the mini table lamps and particularly the new style! Love the idea that you ask your readers for their views in your polls. A good idea. I also love the tiny table lamps and the gift wrap is beautiful. So many lovely items. Can’t wait for the new Christmas ornaments! 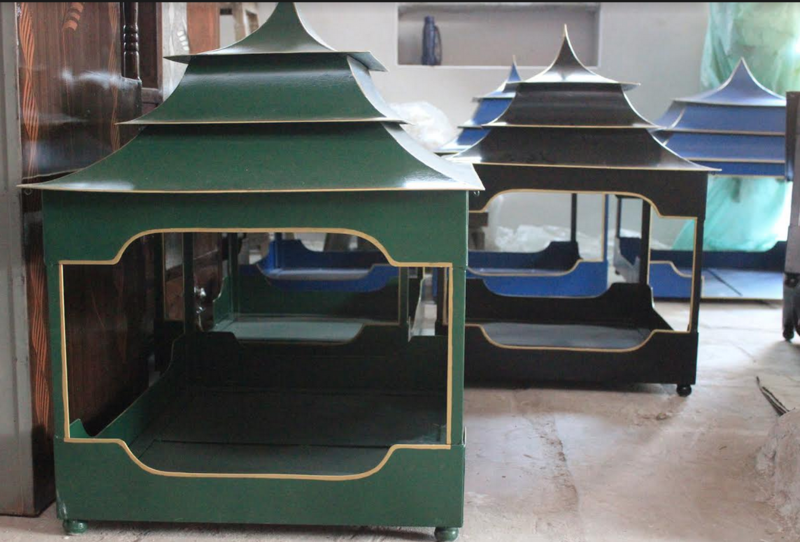 Those pagoda dog beds are DARLING! What an exciting time for you, Tina! I really like many of your items—both new and old—but my favorite is the new Christmas wrapping papers. Congrats on all of your creative ideas! 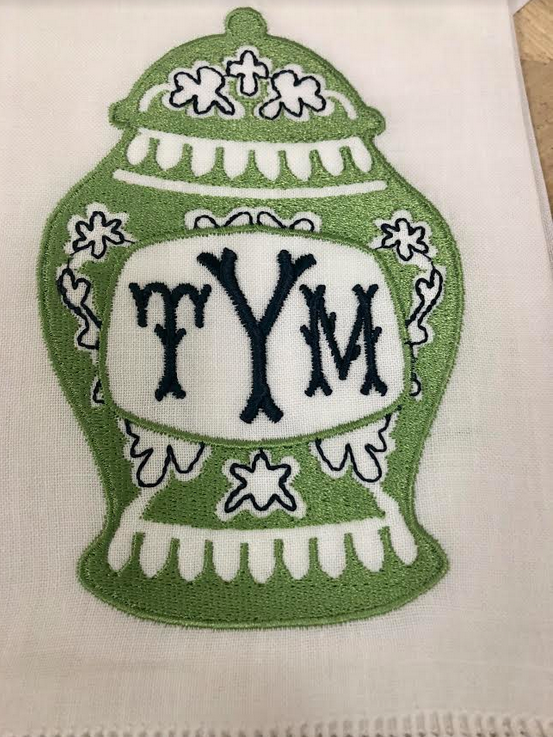 Several new items are speaking to me…..the monogrammed linens are so beautiful as well as the solid black tole planter- a classic beauty! Your creativity is amazing. I’m loving the Christmas wrapping paper and ornaments and the lamp shades. I like the beige tone lampshades–lamp and sconce sizes. Can’t wait for the staffodshire dog ornaments. I’m most excited about the charges and silver planters! Timeless, elegant and most importantly – useful! Those guest towels are beautiful! And Fido needs the new dog bed. I’m not sure how you keep coming up with more and more ideas. You must be surrounded by wonderful people. I can’t wait to see the chinoiserie metal shades. Love the teaser. I am really excited to see the painted metal lamp shades. I also love your pleated fabric shades and look forward to them. Thank you. I love everything but I am mad, crazy in love with the wrapping paper! LOVE the chinoiserie metal shades!!! Hurry!!! So much great stuff! 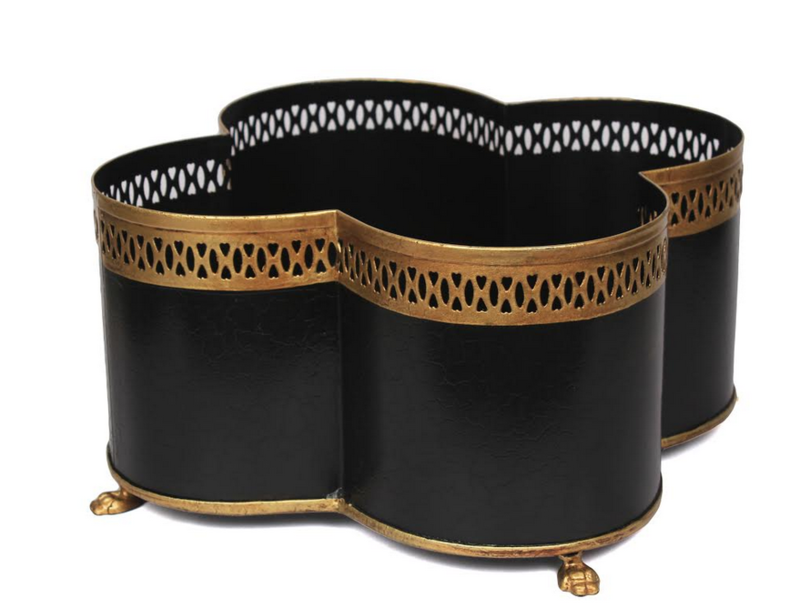 Loving the new pleated shades for sconces….can’t wait to see what you offer! I’m in love with the ornaments and plan on ordering more this year. I am excited to see the metal painted shades and also love the fabric shades! 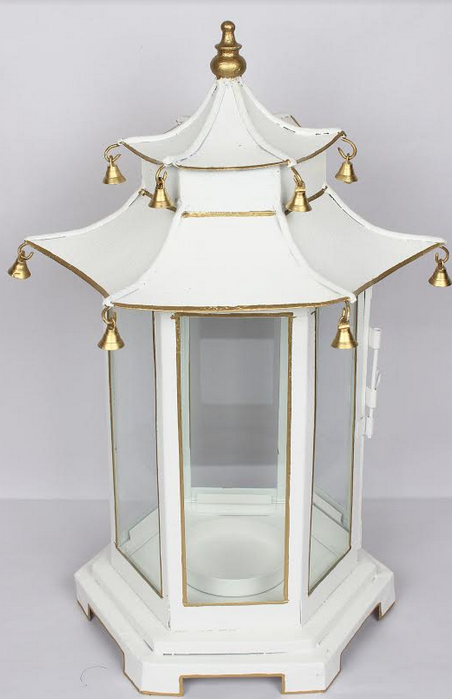 Metal lampshades and pagoda lanterns are my faves! The linens and featured fabrics are gorgeous ! 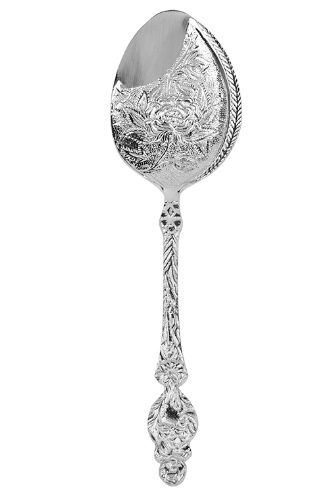 The silver pieces are exquisite-each and every one . if I win this contest , I will need to find more storage space ! 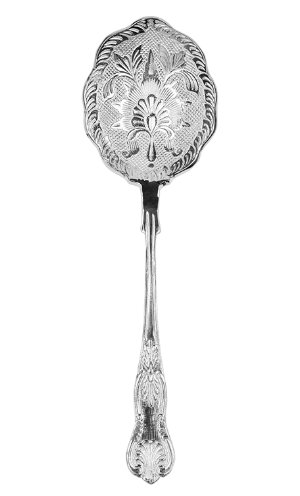 Love the basketweave flatware! So unique! Too many ideas! My head is spinning! Love monogrammed bed linen and the pleated shades. Would love different blue and while patterns in the shades for the sconces! Love the new wrapping paper and sconce shades among other items. The monogrammed linens are beautiful! Many great designs and new offerings. I love that you share and ask for feedback. Excited about the lamp shades. So hard to find anything other than boringly ordinary! Tina, the Staffordshire ornaments made my heart leap! I cannot wait for your presale. These little puppies will make a charming addition to my ginger jar and ball collection! I love the gift wrap too. Where do I begin? This is like Christmas a few weeks early, what a visual treat! OK the gift wrap and ornaments are holiday perfection. I cannot wait to order. 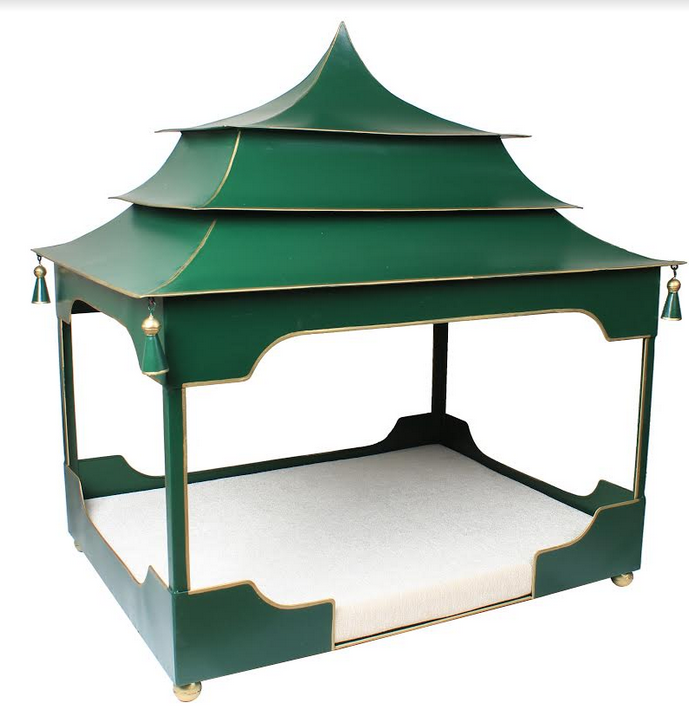 My sweetie Maltese, Lola has been very good and deserves that pagoda bed in green:-) The silver, porcelains are all beautiful. Love the lampshades, and will be your first order, what a grand idea. My in laws are in London and you are right, it is a very popular look in Europe, one that seems to be catching on thankfully! 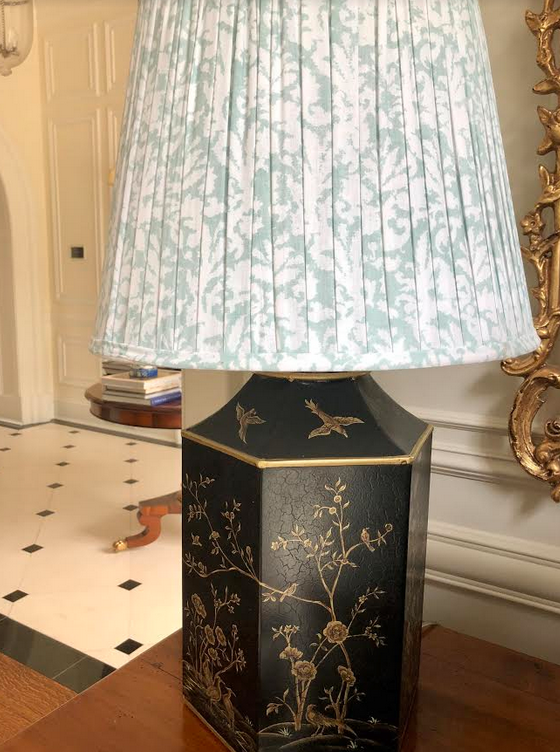 Last, the chinoiserie metal lampshades ala Degournay will be a huge hit, what classic beauties they are. Congratulations on creating all of these amazing products, we are so lucky to be the recipient your gifted creativity. I love the holiday gift wrap! Even though our dog died earlier this year, I have to say the dog bed is my favorite. It is fit for a king or queen! I am most excited about the new miniature ornaments, I tried to order some last year and they were all sold out. Hope to get in right away on them this season. Love just about everything you produce!!!!! Pretty much everything you offer is fantastic. Thanks for the opportunity for the gift wrap giveaway. The designs are lovely. 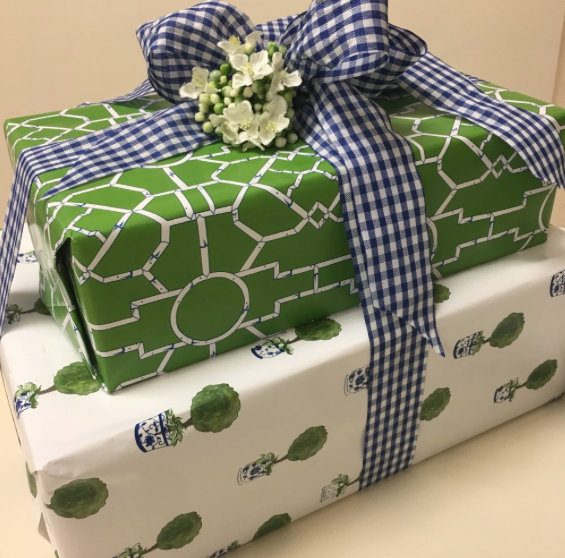 I am so excited about the new giftwrap! Chinoiserie metal sconce shades are great! Adore the gift wrap and ribbon and package toppers.. You have been a creative busy-bee. Congrats! Luv it all. The new ornaments are amazing! I love the silver lamps!! And being from the south, one can never have too many monogrammed linens!!! Not to forget the gift wrap! Just beautiful!! I AM MOST EXCITED ABOUT THE NEW LAMPSHADES! love having the chance to weigh in on your product development. You have a great design sense and all of these items will be hugely popular. I really love the giftwrap. Excited about the sweet gift toppers coming back – missed out last year! 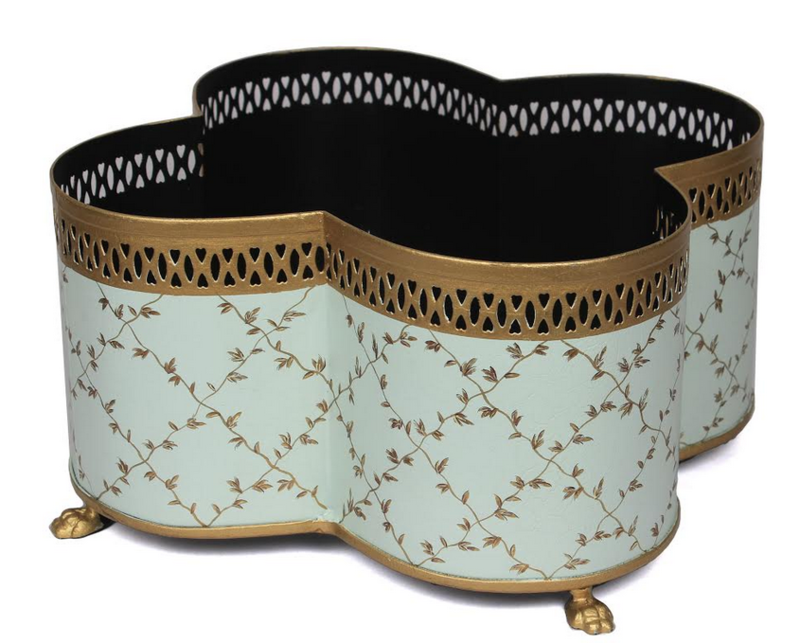 Love chinoserie hand painted metal shades and will be ordering Christmas wrap to match my ornaments! I am most excited about the pleated lamp shades!! I desperately need them for my bedroom!! 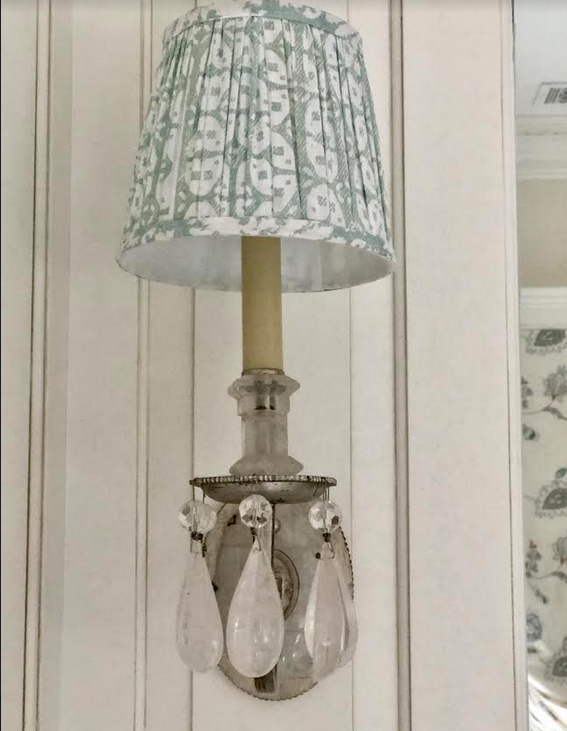 Love to see handpainted lamp shades in solid Color with a Greek key border. you decide what all your fans desire. Very nice post with so many beautiful offerings. My favorite is the new style mini table lamp, just what I’ve been looking for. Can’t wait to order for the holidays. Looking forward to the pleated lampshades, quite special and classic! 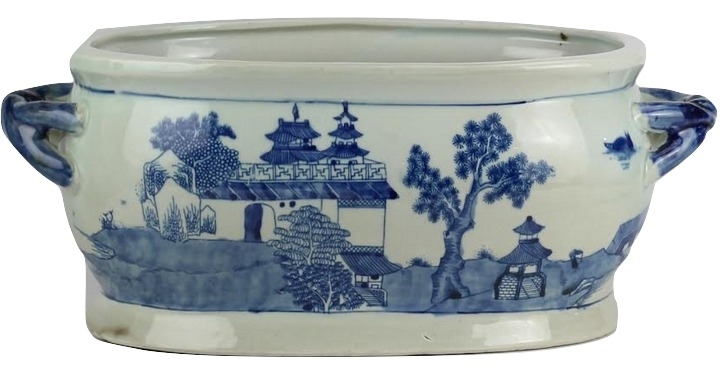 I am most excited about the blue and white porcelain! Love the blue and white pumpkins! 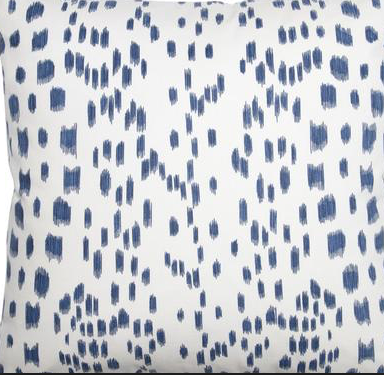 So great to mix in with other blue and white items! 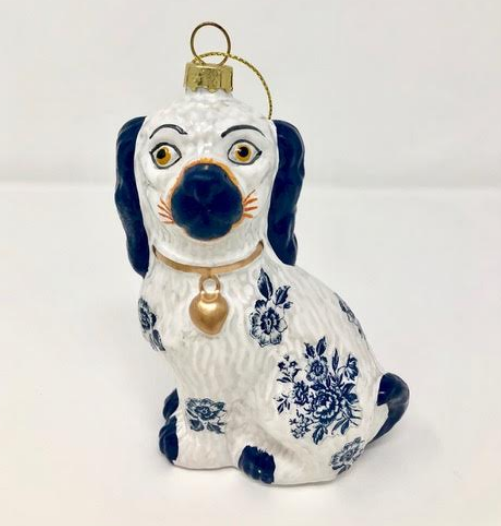 I can not wait for your Staffordshire dog ornaments to be offered and will be adding more of your ginger jar ornaments to my collection! Love almost everything in blue and white. Love true blue and cobalt blue especially! Love pagodas! 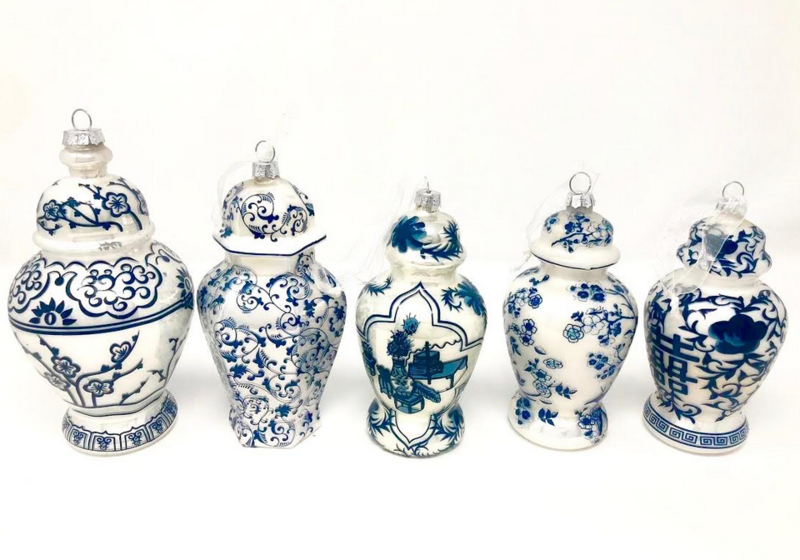 Would really like some unbreakable blue and white Christmas ornaments. I love all of your ideas and those pleated lamp shades are amazing! I think that fabulous metal lampshade has my name on it! Love the metal shades!! Would love to see candle cup shades in your line too. I am always most excited to see the beautiful porcelains! Super excited about ornaments and wrap and linens! Fantastic job! The pleated lampshades are beautiful and I just love them. Everything in your shop is so tasteful and perfect for gifts. Love the wastebasket and tissue holders. I’m also looking forward to seeing the finished metal lampshade. Would like to see more products with reds and deep yellow (such as ochre). I am most excited about the dog ornaments!! My grandmother and mother had Staffordshire dogs (about a foot tall) in their homes, and I want to get a set for myself and for my sisters for our trees. They will bring back such fond memories! The pleated lampshades and chinoiserie handpainted metal shades are my personal favorites. They are classic timeless pieces! 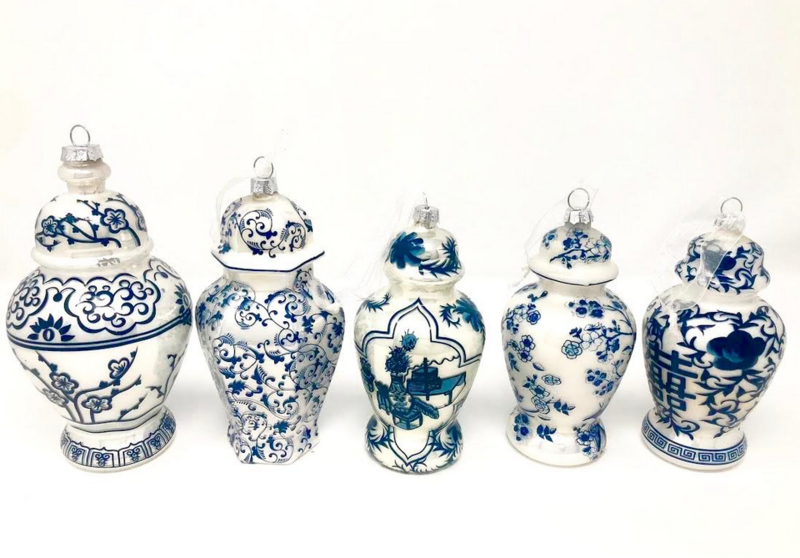 Tina- so many great ideas, but I have to admit I’m a blue and white fan all the way and always most excited to see what porcelains you are selling. I love the ginger jar and bamboo monogrammed linens. Looking forward to adding the bamboo quest towel to my powder room. I LOVE! LOVE! LOVE! that chinoiserie painted lampshade. Please tell me these will be fullsized shades. I will buy them for my embarrassingly large collection of alabaster lamps. When will they be available? Hopefully before Christmas so I can splurge and call that my big present and have them installed for Christmas entertaining. Love all your ornaments! I can think of many ways I would use them! I just love your new porcelain pumpkins. They are so beautiful and festive, and I know they would be a wonderful addition to anyone’s autumn decor!! I am always so inspired by your designs to create more beauty in my home. 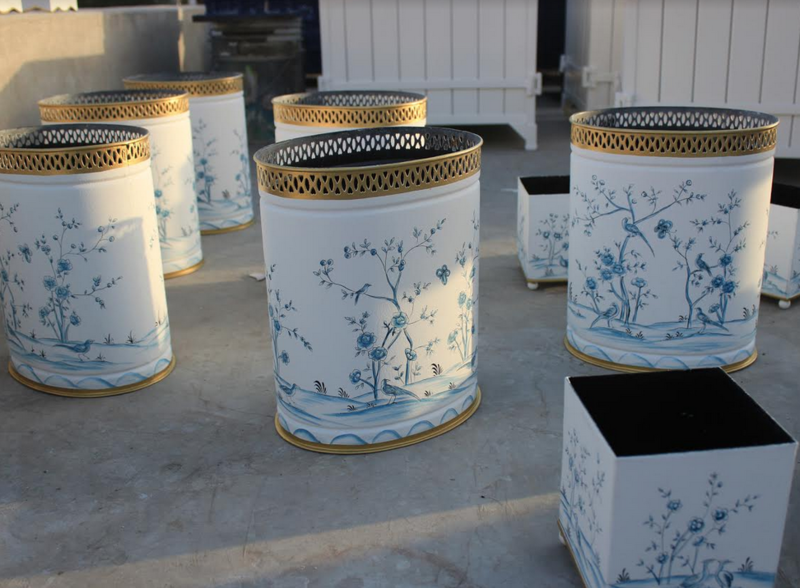 Love them all ……so really hard to chose…….I love all your blue and white porcelain but if I had to chose your planters are my favorite. I have really enjoyed your gift wrap as well and looked forward to additional choices with the gift toppers. Love the pumpkins! My favorite thing! I LOVE the staffordshire dog ornaments ~ the monogrammed table linens ~ the dog bed ~ and the painted metal lampshades!! All winners! 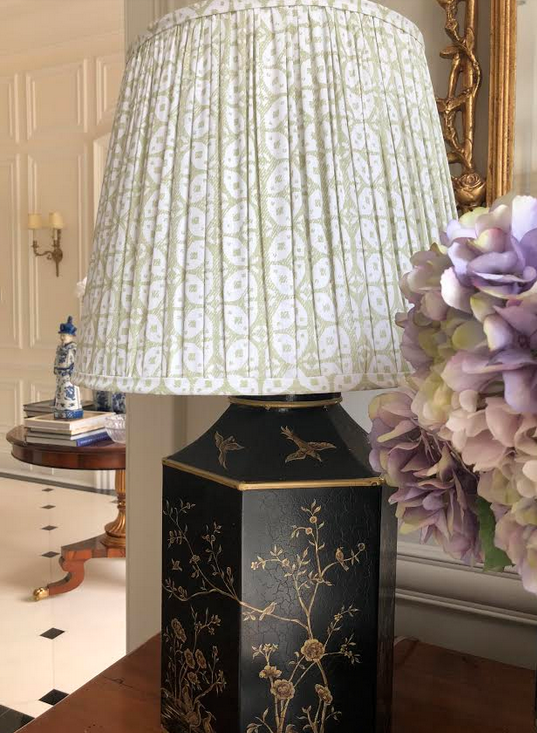 LOVE the hand painted lampshade…….so chic and classic! OMG, this was a very long and fun post to read! So many new things to choose from. 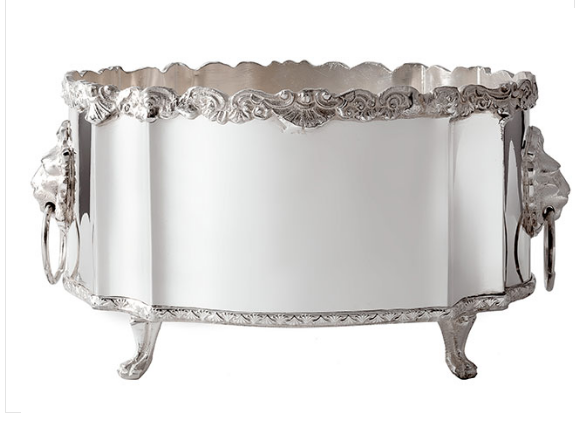 I especially love the smaller, silver planter and would love to put an orchid in it. I also love the new gift wrap with the dogs and presents. Everything I love all “rolled” up into one paper! So glad that you’re carrying blue and white gingham ribbon; it’s impossible to find! Will the edges be wired? I hope so, wired ribbon makes the best bows. I also love the new fabrics, can you make pillows with them? I love all your well thought out and beautifully crafted products- so many choices but have to say the ginger jars top my list! Great post! So nice to see your interest in customer feedback. I’m dying to get my hands on some ornaments this year and love the wrapping paper! LOVE The blue and white pumpkins. Their are quite a few “copies” out there, but none appear as exquisite as yours. PS. Breast cancer thriver and metastatic melanoma surviver in remission..
Feel like a “kid in a candy store” looking at this post. You have such insight and talent to put together all these wonderful items. Picking one is so hard BUT have a need for wrapping paper for a charity luncheon I am chairing where the centerpieces are wrapped gifts so-o-o Christmas wrapping paper would be my choice. Thanks for making my morning today! The crystal candlestick lamps are stunning! 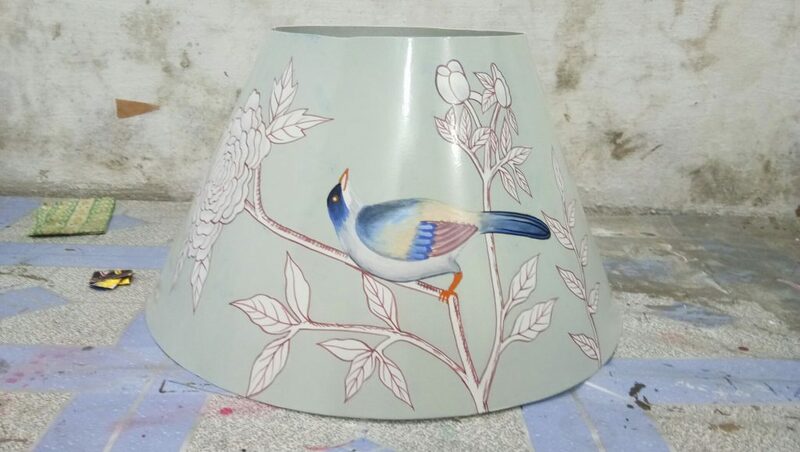 I love the metal painted lampshade that is “in progress”. Can’t wait to see the collection! I’m loving the possibility of pleated lamp shades! Of course I love the wrapping paper but I really like the silver chargers and serving pieces. Thinking about the up coming holidays. So many beautiful things! I love the pumpkins! They are very charming. Also the basket ware is adorable. All you new items are fun to hear about. Could not be more interested in the pleated shades. Such a wonderful, classic look that I have always loved. I will look forward to seeing the fabric selections. I also love the painted metal shades. Tina, I would wish to see more pillows in your shop. Have purchased a few and like them very much. The idea of a frequent porcelain buyers club is spot on. Do it! I will be purchasing some of the mini lamps in the near future. Think they are elegant and special. Blue and white new items! The dog beds and staffordshire ornaments are adorable. The new dining table lamp is very appealing; as well as the pretty wrapping paper and gift toppers. 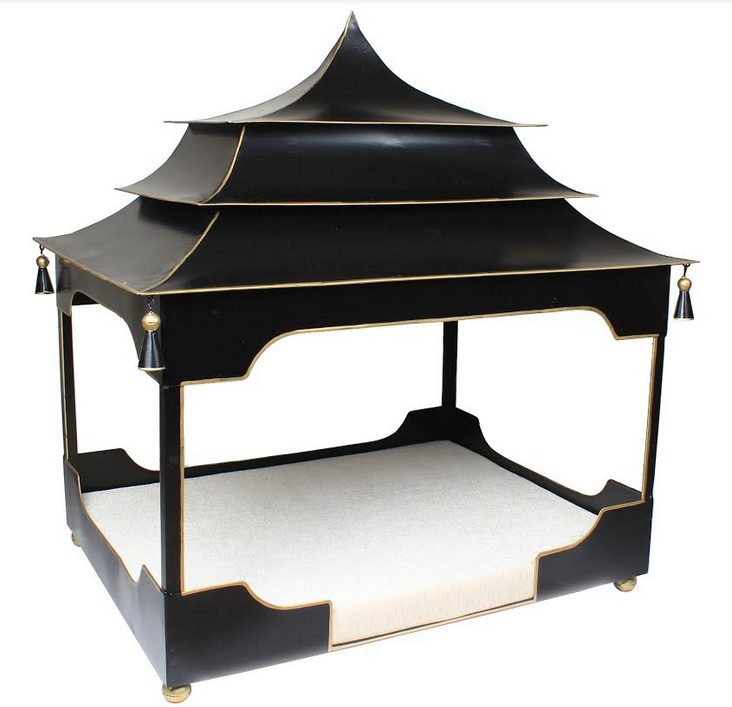 Pagoda dog beds give me life!!!! My adorable mini doxie needs one! I really like the newest addition to your Christmas wrap. Love, love, love the green ribbon. I have been waiting for the lovely Christmas wrapping. I have a smile knowing, Christmas is coming soon. I love the monogrammed linens. The holiday wrap is lovely. Love the lamp shades!! So hard to find good ones! I LOVE the blue and white pumpkins!! 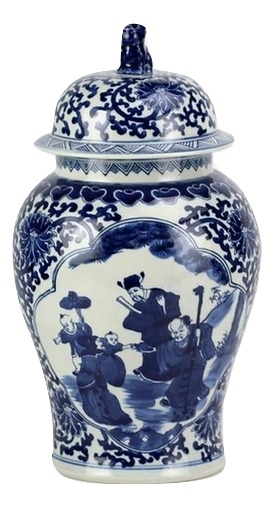 I just ordered two more ginger jars but can’t wait for the new shipments! Your pumpkin designs are amazing and will add a classic fall look to any home. Favorites have to be the shades…so hard to find unique, elegant shades of all sizes. I’m highly interested in seeing the painted metal shades and sconces, they are a gorgeous idea. 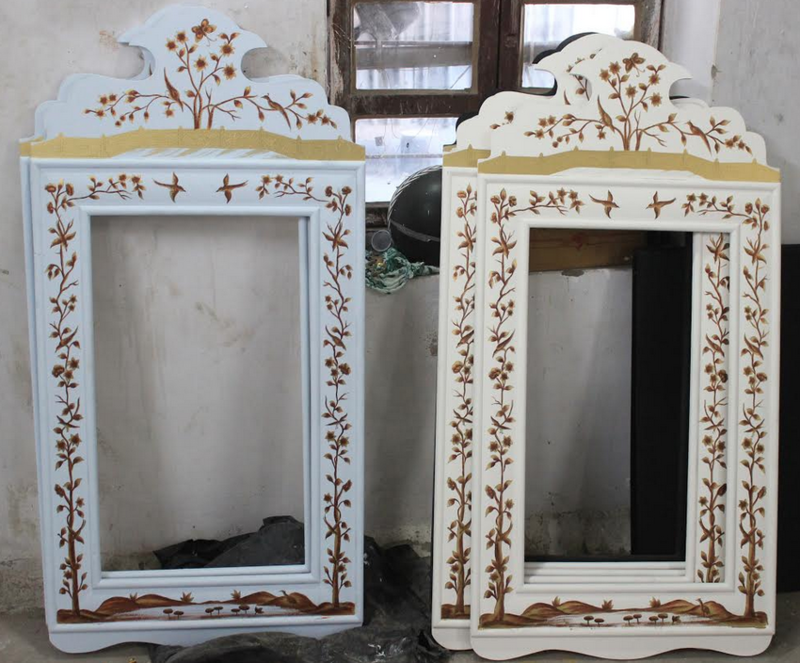 Will look wonderful especially on antique lamps. Love so much…how to pick? Looking forward to ordering some wrapping paper and ribbon for Christmas gifts and topping them off with a porcelain gift topper! 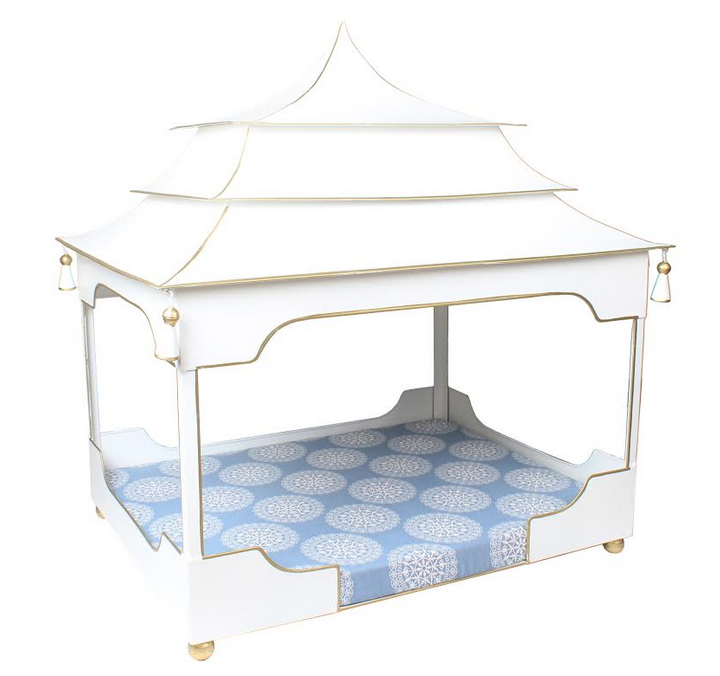 The pagoda dog beds are adorable!! I also like the pleated lampshades. As always, thank you for offering a generous giveaway. I love the pleated shades in blue and white of course! Can’t wait for the Staffordshire dog ornaments & monogram napkins. Wow! You’ve been a very busy chick! Cant wait for the new style of the mini silver lamp! And I love the lampshade for sconces/chandeliers! Monogrammed bedding sounds interesting, especially if they are the super big ones that are sometimes done on European shams. The new porcelains, ornaments and gift wrap sound interesting. I would love to see monogrammed bath towels like you had in one of your bathroom pictures at your new home. 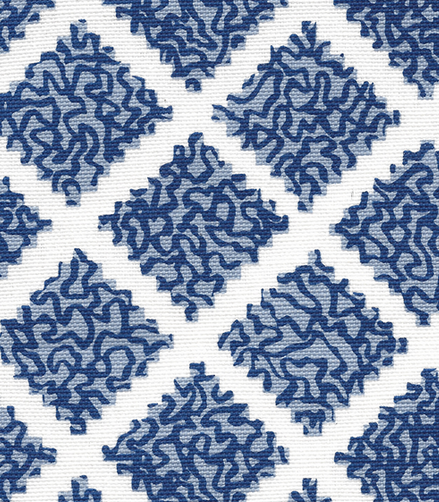 Blue stitching on white towels. I would like any design really if it is blue on a white towel. Still dreaming about mini lamps being offered in brass or gold color. SO many pretty things!!! But I really, really love the monogrammed linens! I can’t wait to get the staffordshire dogs to add to my tree this year. Absolutely love them!!! The Christmas ornaments are my favorite items! Love the decorations for packages and all the new choices….the sample packaging is stunning! Those little silver lamps – so great!!! I also really love the Holiday giftwrap! Love, love, love the pleated shades and the monogrammed linens. Cant’ wait for their arrival! It’s all fabulous but my favorites are the new ginger jar Christmas ornaments. So looking forward to the new gift wraps and pumpkins! Amazing creativity. The pleated fabric lamp shades are perfect to update lamps. Keep up the great design Tina. So glad I found this site years ago. Really excited about all your new items. Love the lamp shades. I love the new linen towels! 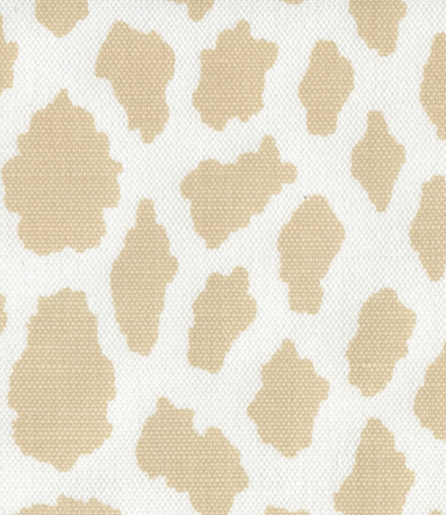 And will be super excited about the bedding to come! The ginger jar ornaments! I stalked them last year but never pulled the trigger. This year they are mine! 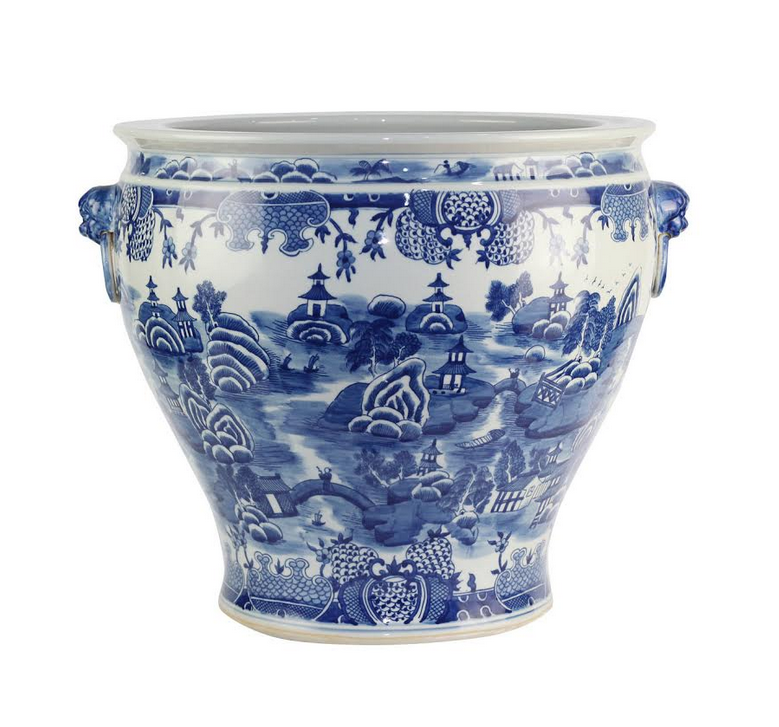 Also saving up for a pair of those gorgeous porcelain fishbowls for my front stoop! 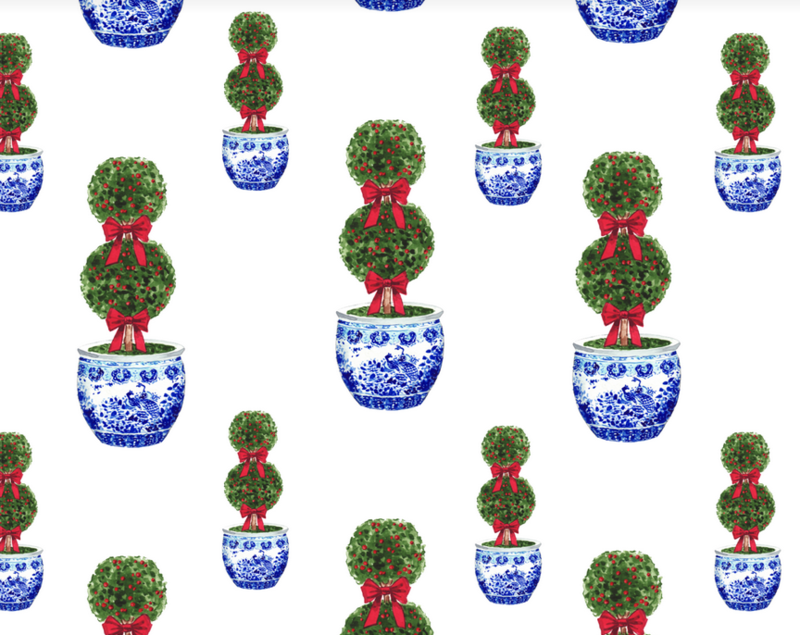 I have the faux boxwood topiaries already picked out! Love all of your products. Thank you for all your hard work!! I love the ornament gift toppers! I’m most excited about the porcelain pumpkins because I’ve never seen anything like it on the market before! Plus, I’m a huge fan of blue & white! Tina, all the items are beautiful and it is obvious that great care and passion went into the development of every single one. We, your fans, deeply appreciate that! I must confess my favorites (for the moment!) 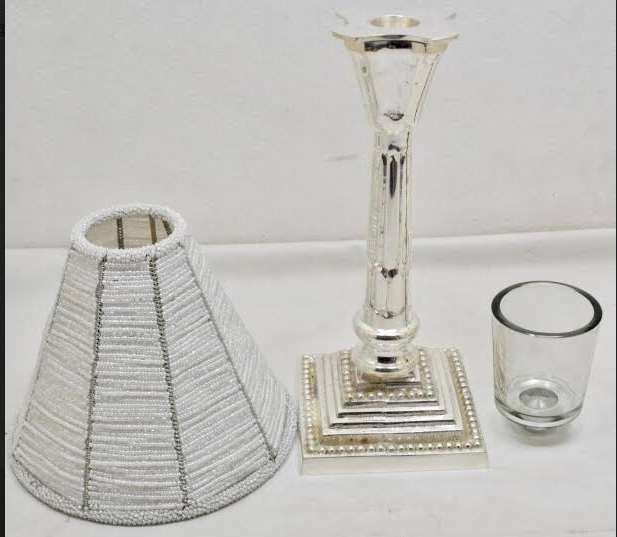 are the gorgeous silver chargers in both styles, the wrapping papers and ribbon selections, and the silver candlestick lamps. Those chargers are just so stunning. 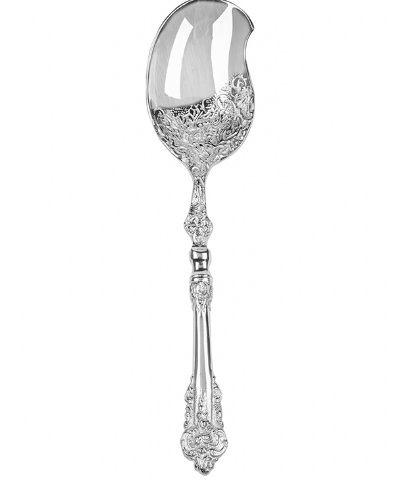 Anyone fortunate enough to own them can certainly set a dazzling table that guests will not soon forget. Really love the new lampshades and sconce shades. They would certainly be a definite decor statement! 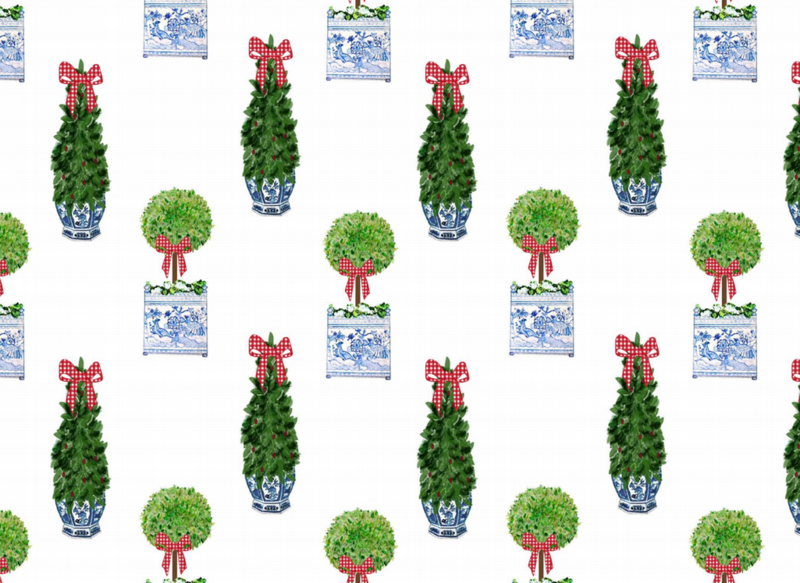 Also love the wrapping paper with the topiary with the red berries! 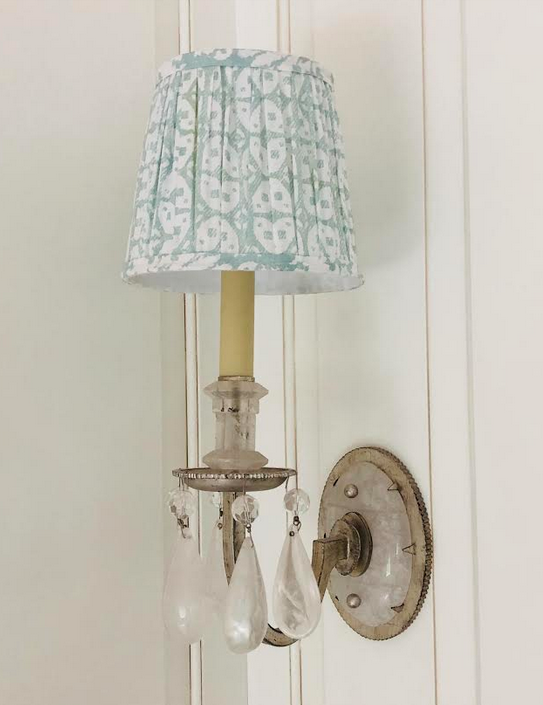 Freaking out over the new metal hand painted sconce shades. I think they are fabulous. Can’t wait to see the finished product. I think they are divine!! Can ‘t wait to get my village bowl in soon! Keep up the good work!!!!! For me it is the dog bed! Just perfect for my sweet little love! Love the stockings and the staffordhire ornaments!! Love especially the embroidered towels, the ornaments and the gift wraps! Thank you for this informstive post! Love especially the embroidered towels, the ornaments and the gift wraps! Thank you for this informative post. I love the mini ornaments. I purchased one set last year and look forward to adding to my collection. I also like the mini table lamps. I especially love the gift wrap. I like to develop I signature style and these would work so very well. The nice part, too, is that they don’t require multiple colors of coordinating ribbon. My second faves are the pleated shades. Look forward to more sizes. Well done! 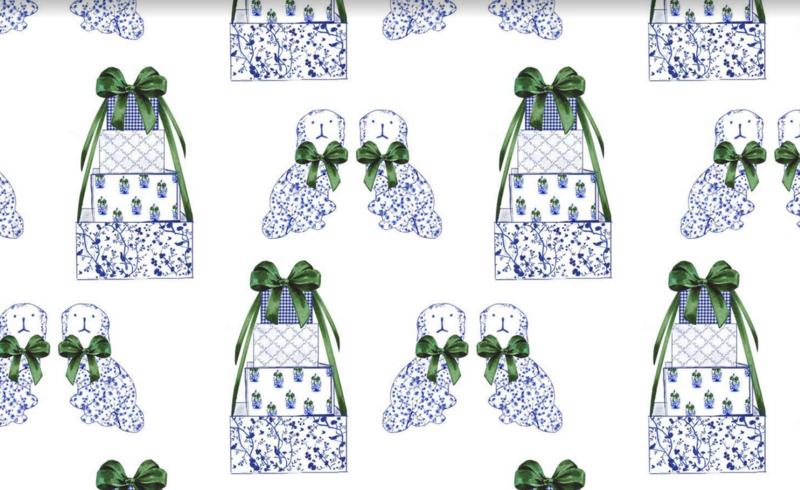 Definitely the new gift wrap and the staffordshire dog ornaments, SO excited for those!!! Those pumpkins are adorable, and I love the gift wrap designs! Porcelains are always my very favorite items and the pumpkins are a great addition that you don’t find very often. Love wrapping paper for all occasions, not necessarly theme related except for Christmas, so the Christmas wrap is a hit with me. Keep up your creative work,it is appreciated so very much by so many of us readers. 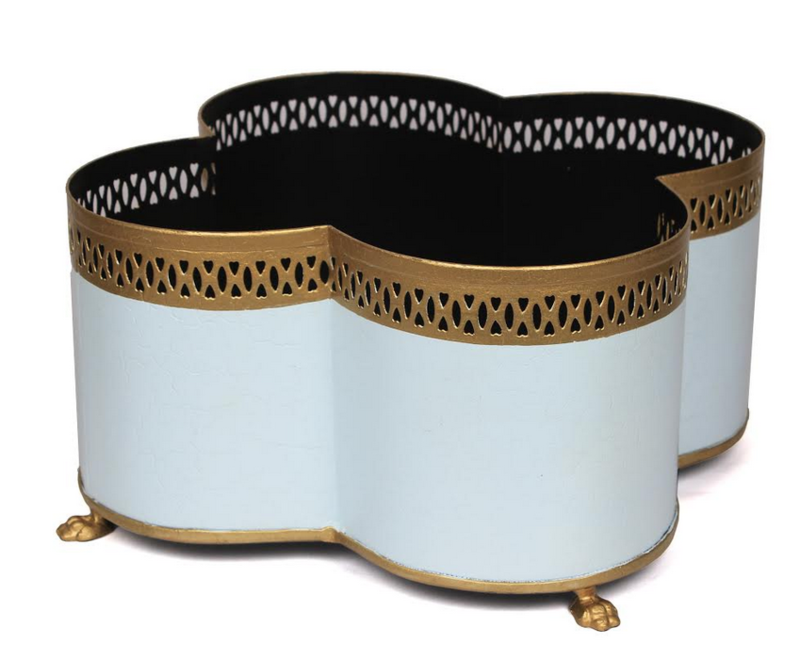 i am really loving the trash cans with the scalloped top.!!!! may very well order! !